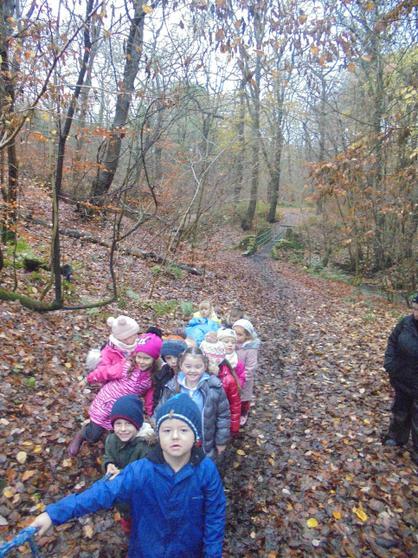 I don't think any of the staff were looking forward to today; it was dark, damp and cold. 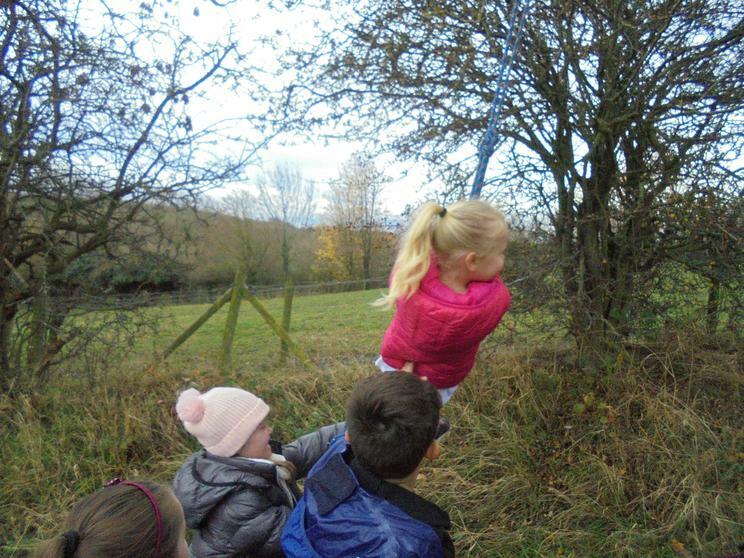 We were met with such a wave of enthusiasm from the children in class 1 that it lifted everyone's spirits. 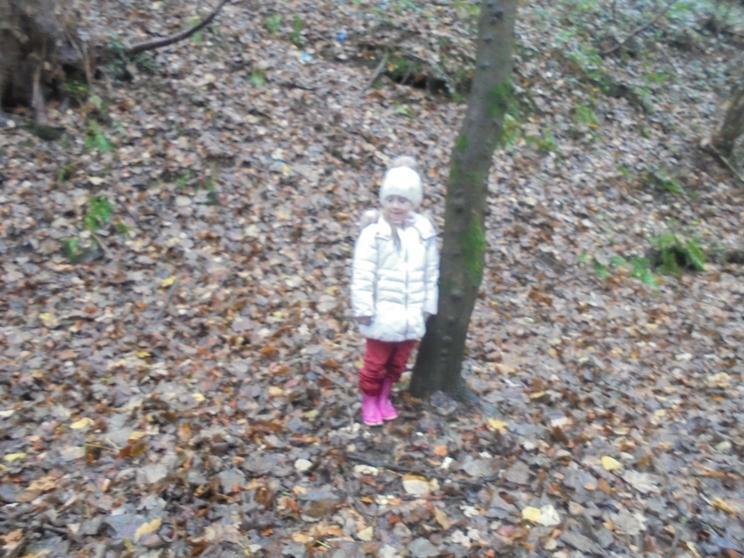 Weather like this does bring home the importance of warm clothes I had 5 layers on so was quite warm, poor Miss Bell hadn't looked at the forecast so shivered a lot. 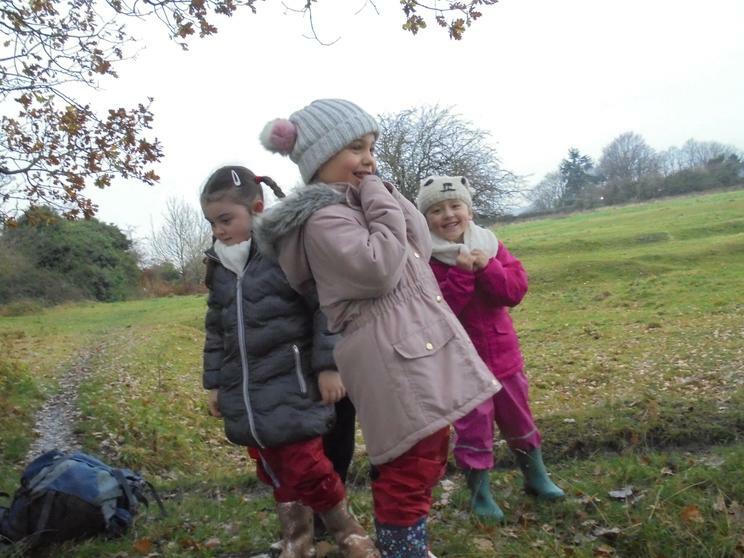 The children spend so much time running around or being busy they only seem to notice the cold as we are going back to school. 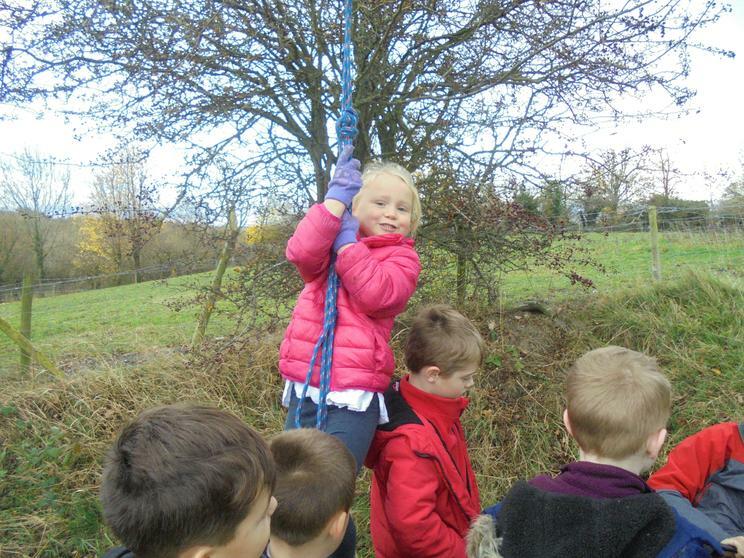 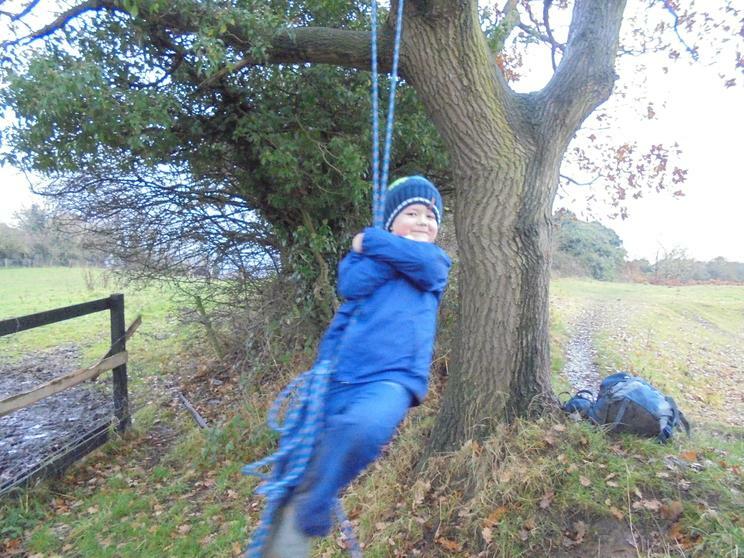 This weeks session started with a trip to the climbing tree where we put up a swing. 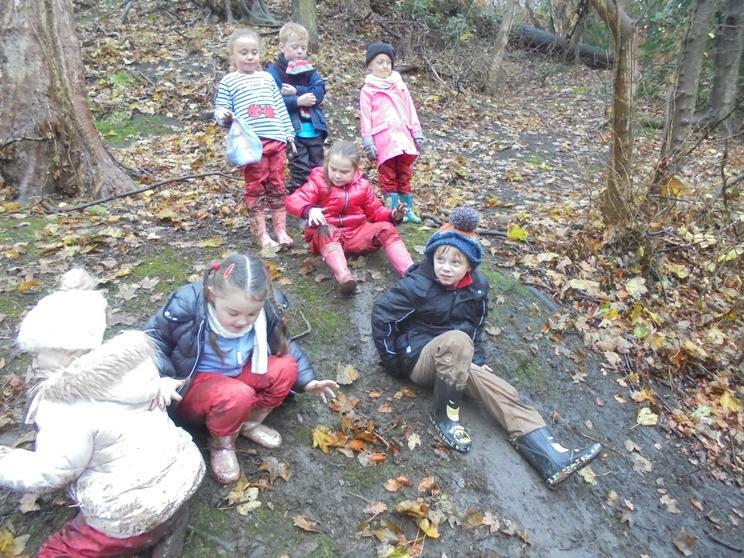 We then went into the Dene, found a badger's footprint in the frozen mud and went to look at the badger set. 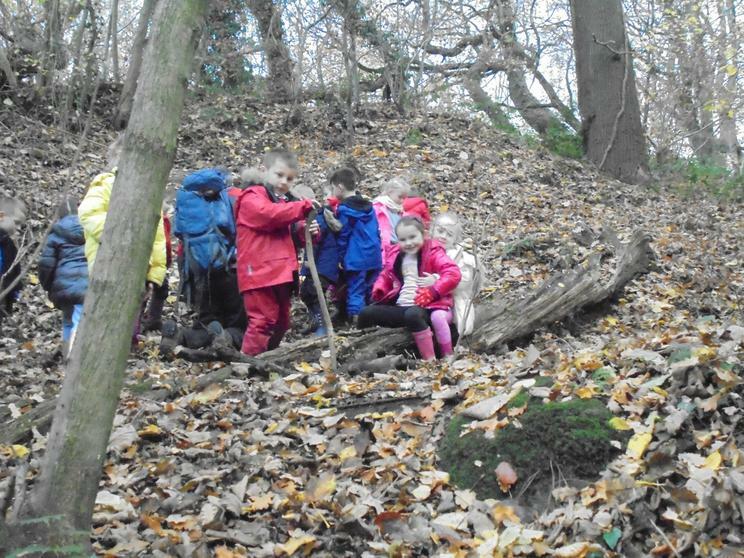 Last year we could see the activity around it, I am not sure if the badgers have left but I don't think they are there anymore. 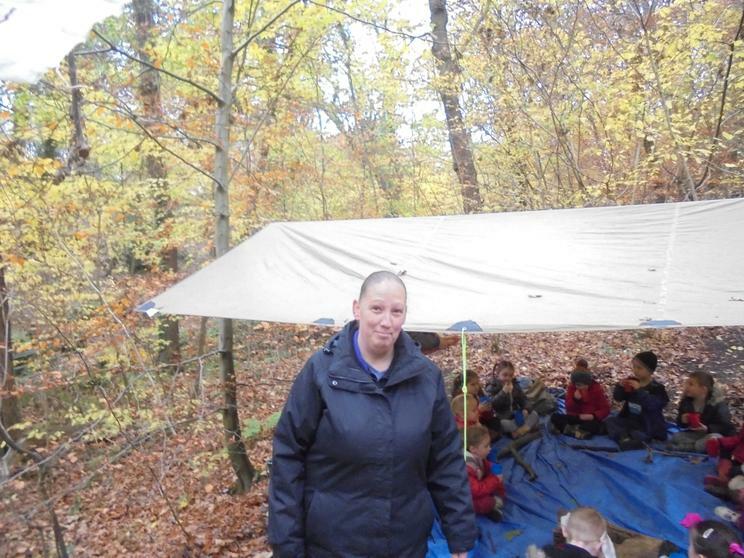 Miss Gibson played games with the children while I quickly put a tarp up. 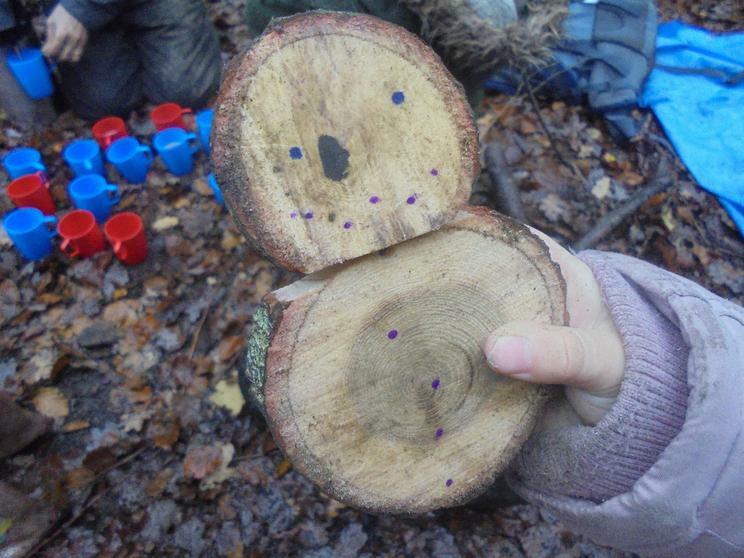 Some children then made bracelets, others made wooden toys. 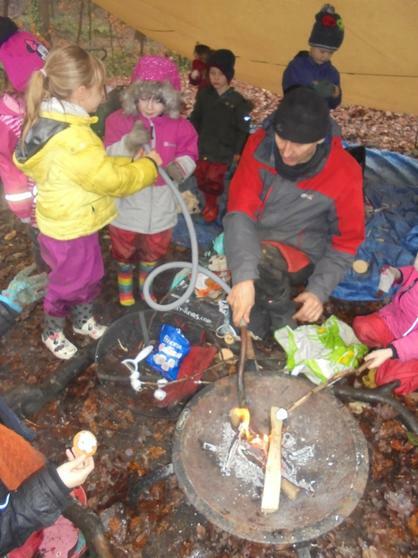 A group helped light a fire and cooked some marshmallows. 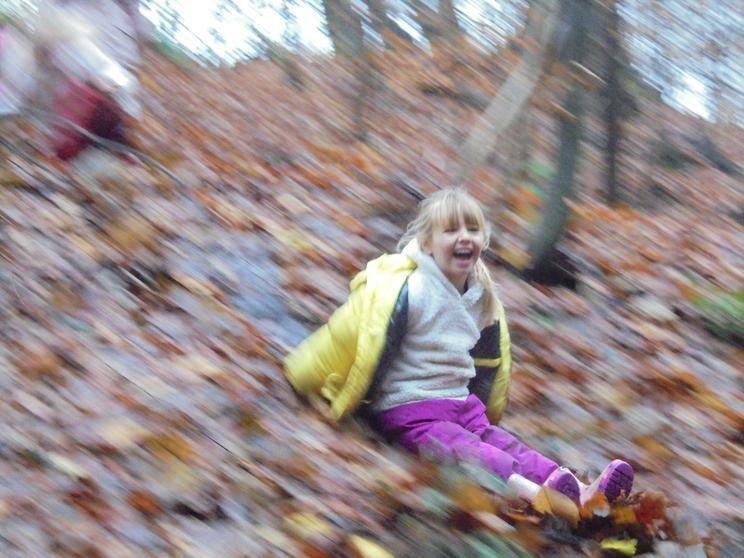 We had a lot of fun with the air blower. 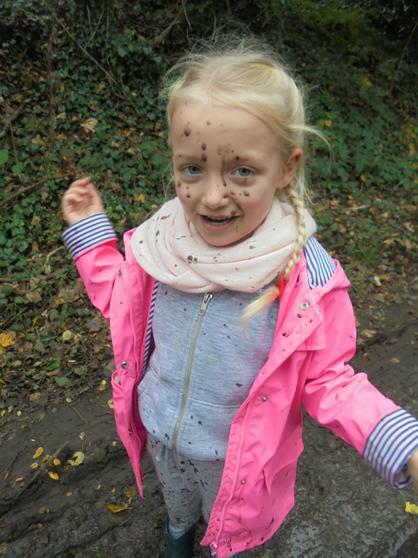 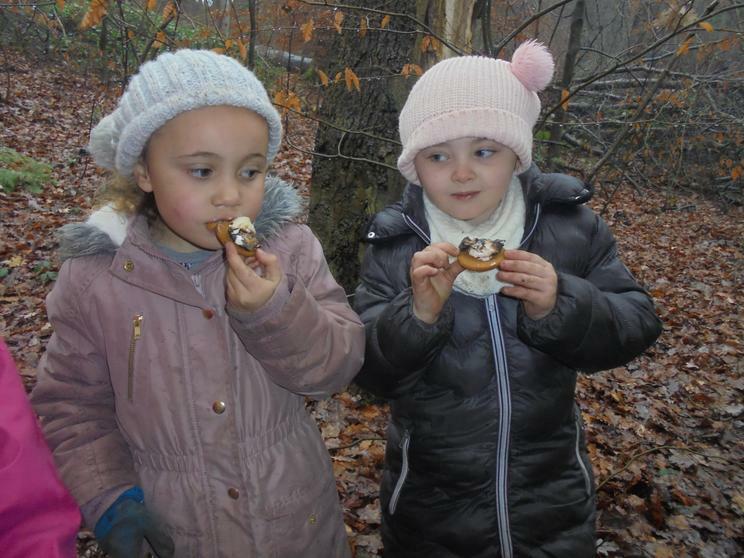 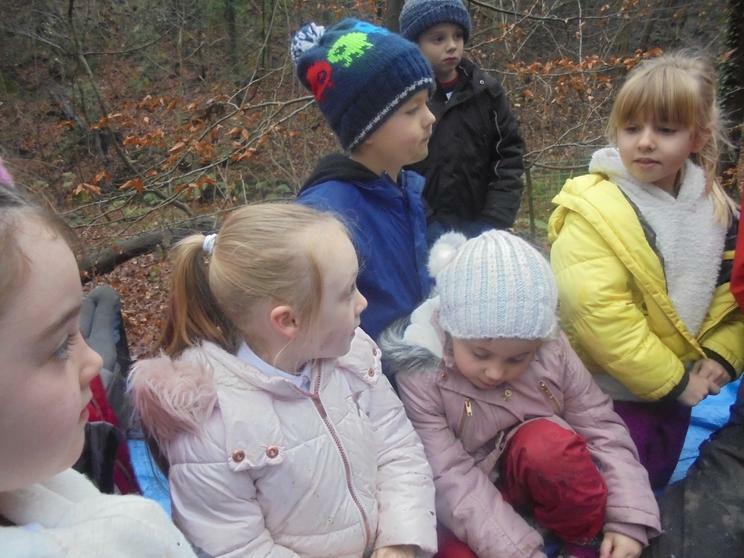 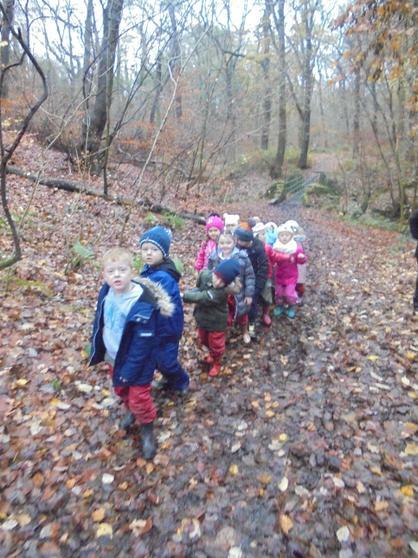 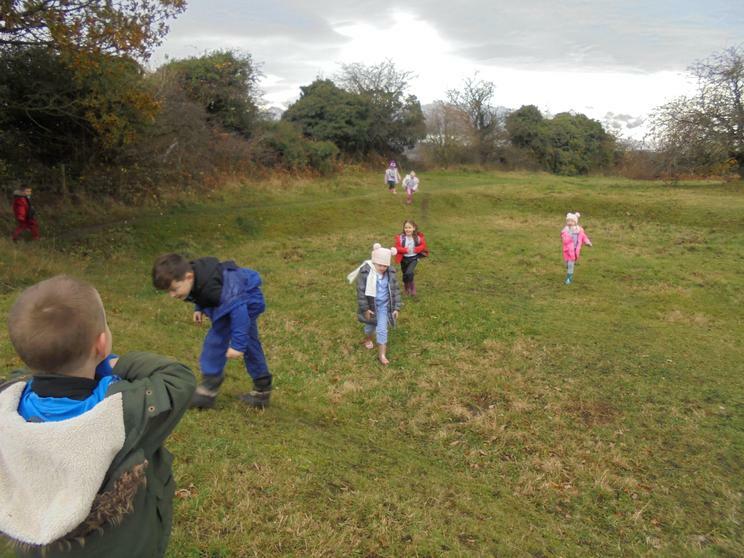 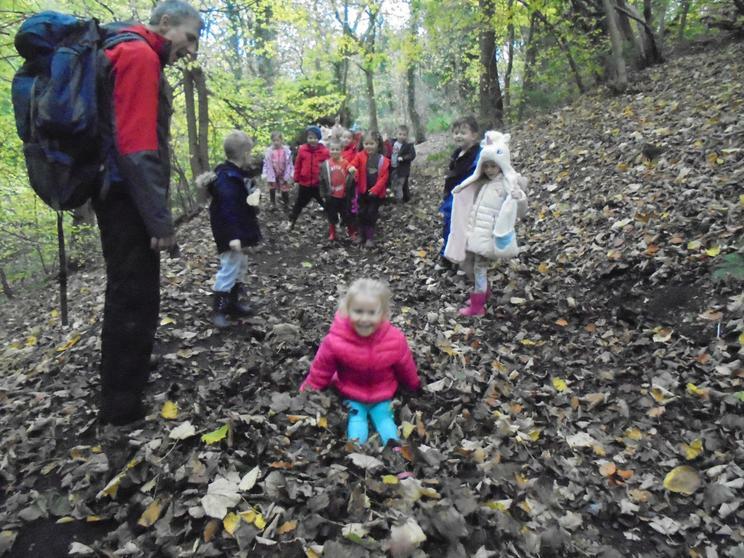 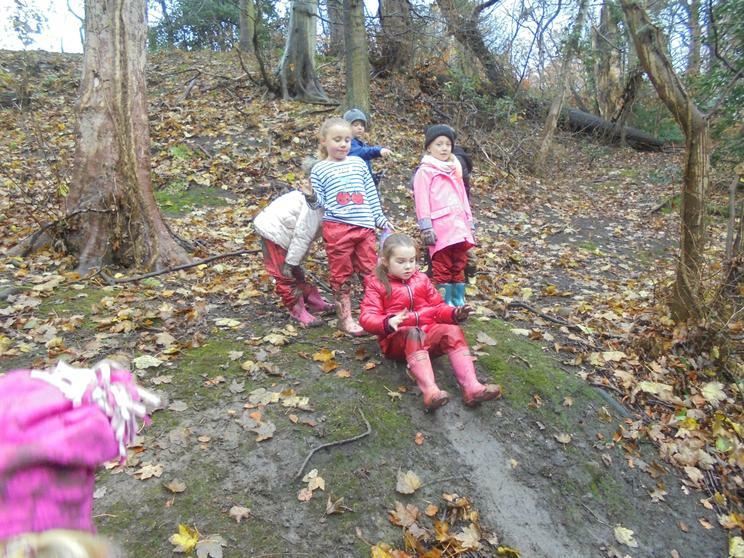 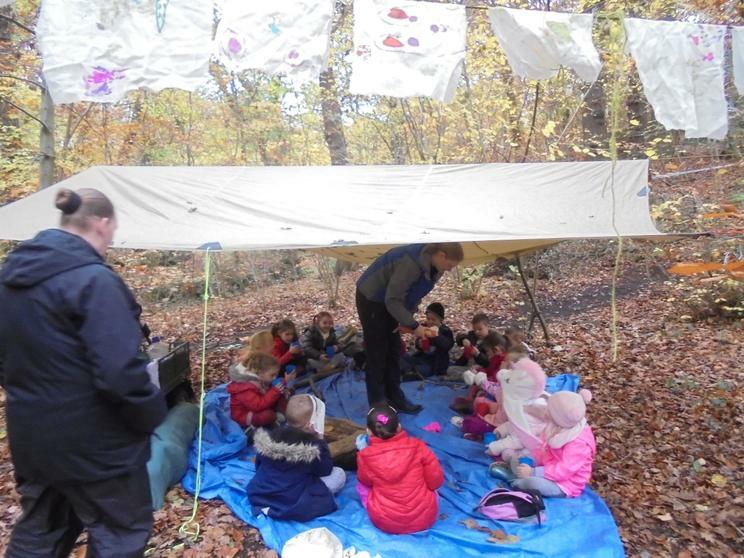 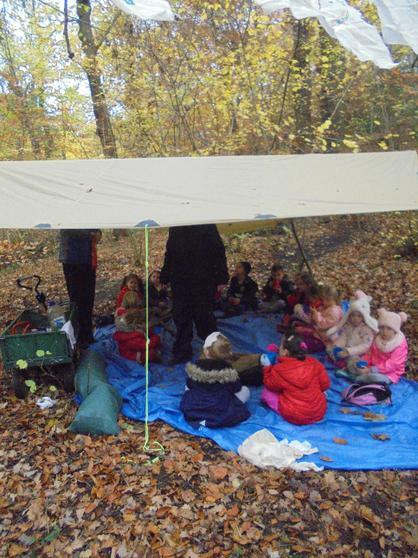 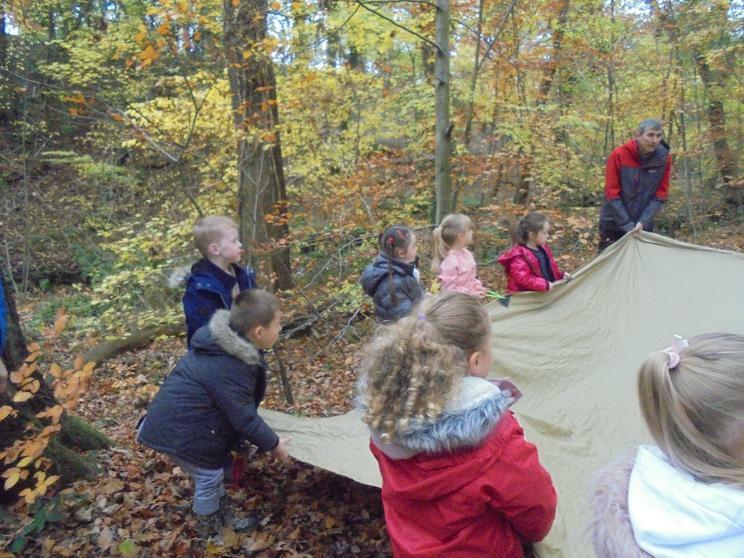 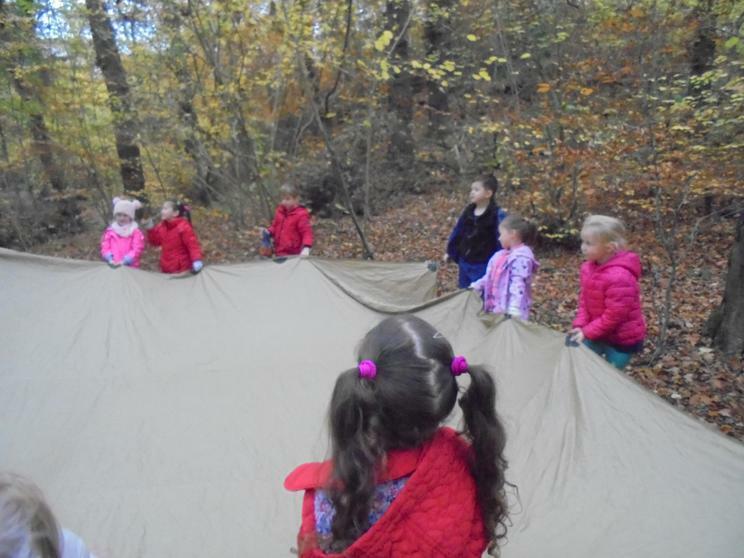 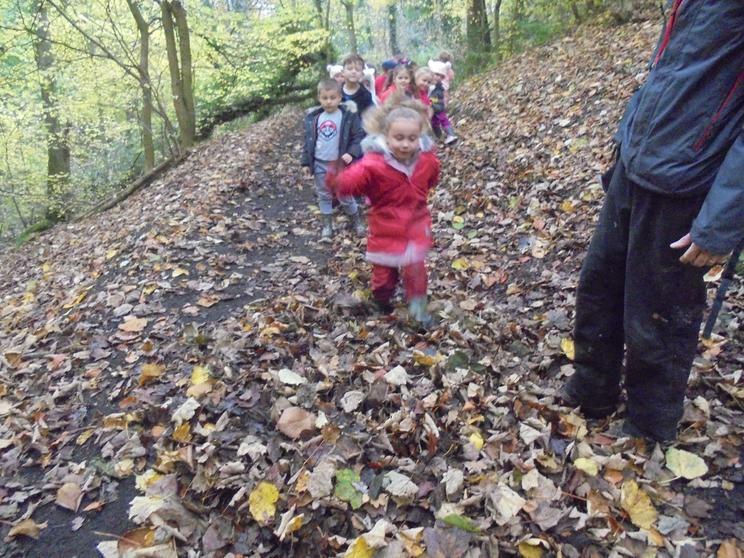 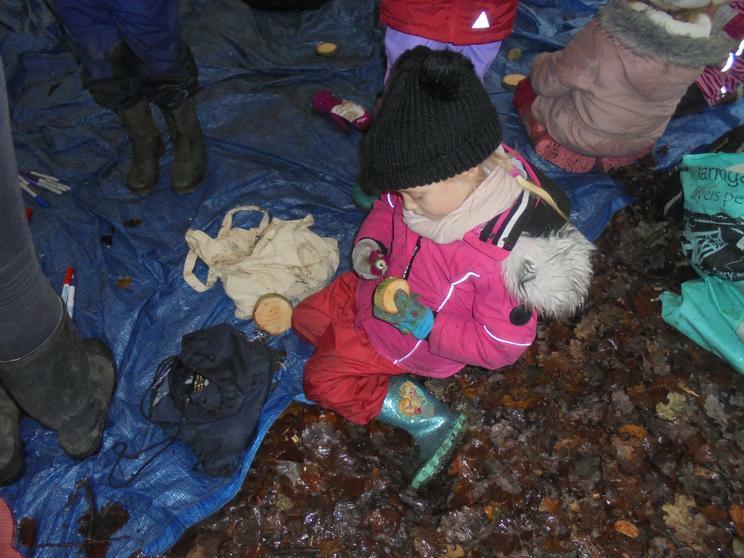 That will be the last time Year 1 have Forest School in the Dene. 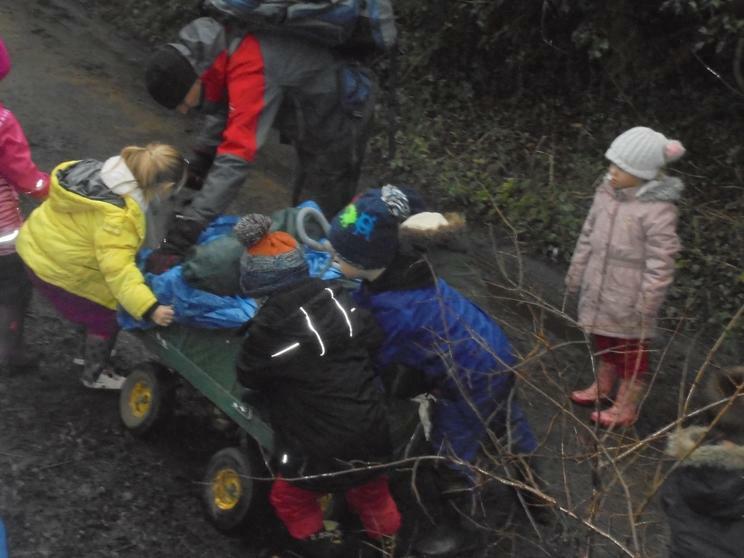 I look forward to taking the children down again in year 2. 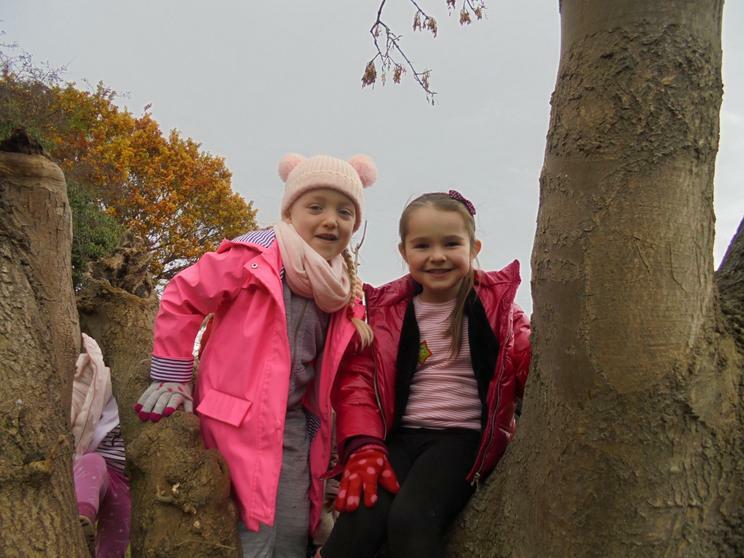 After a difficult journey through heavy mud we needed a break so we stopped off at the climbing tree. 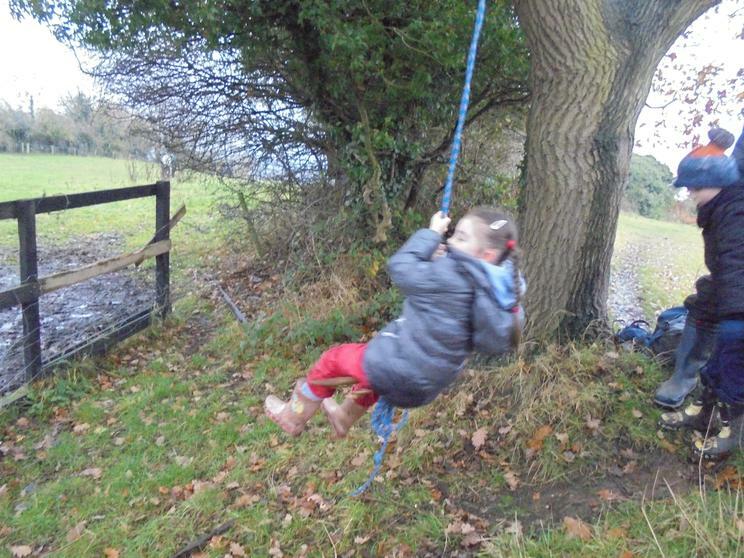 We used a different tree to put up a swing and needed to find extra sticks after the first one snapped. 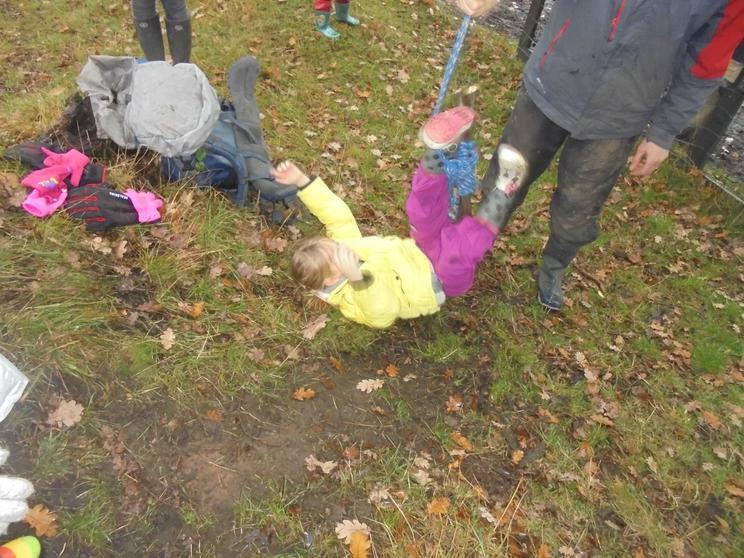 We had fun swinging of the slope. 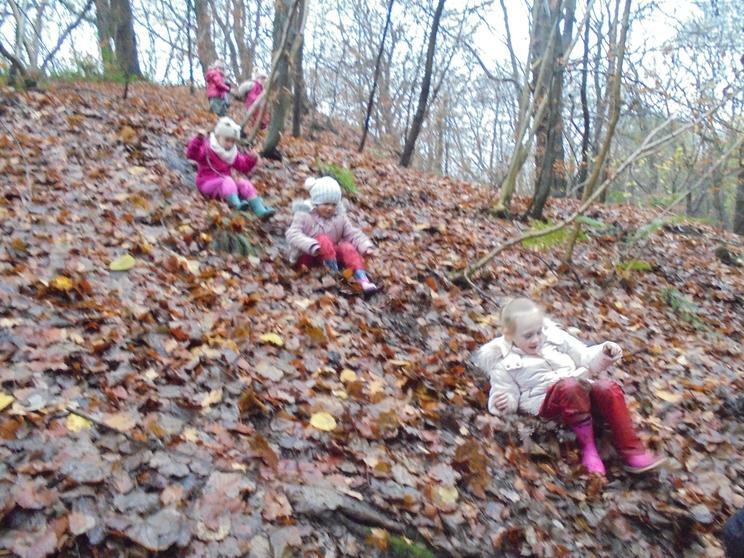 we made our way into the Dene where we found fun things to do. 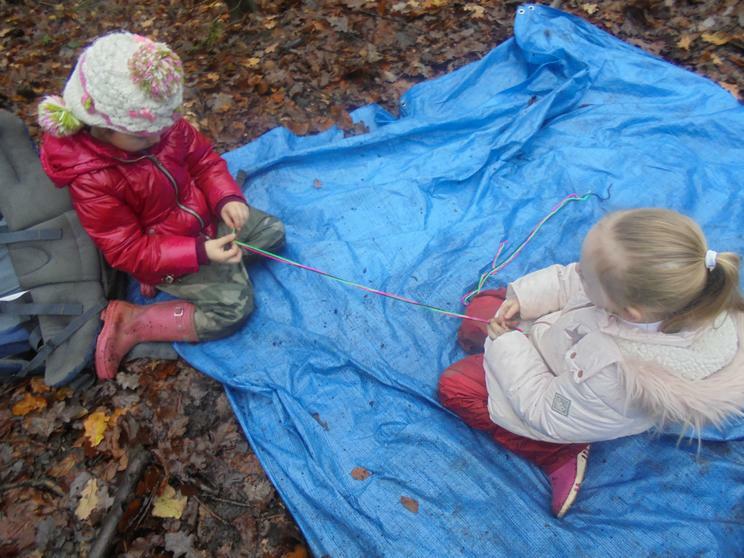 Some people wanted to make things in wood, others wanted to weave with wool and still others wanted to explore more. 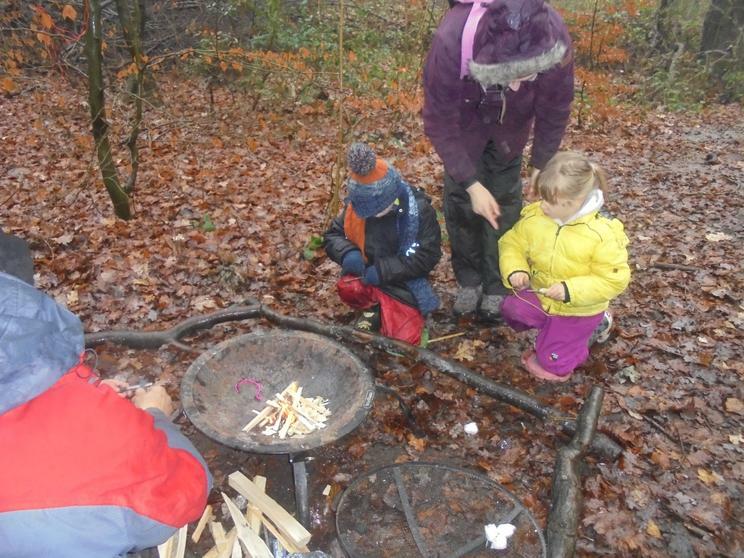 Miss Gibson showed the children how to weave a Forest School band that reminds us of how to behave in the Dene. 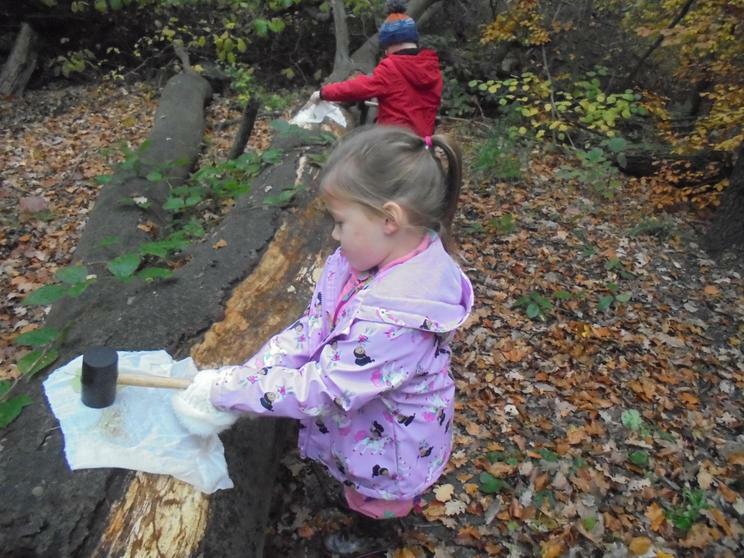 I showed some children how to use the bow saws. 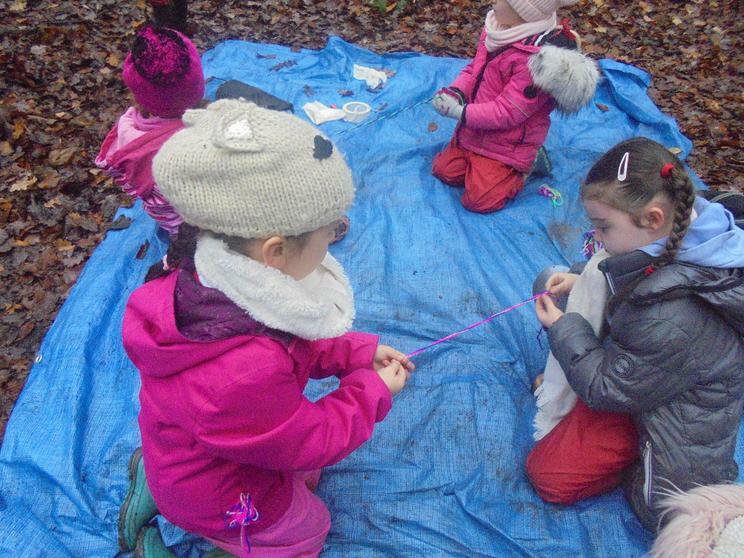 Madison made a snowman while Rose made a necklace. 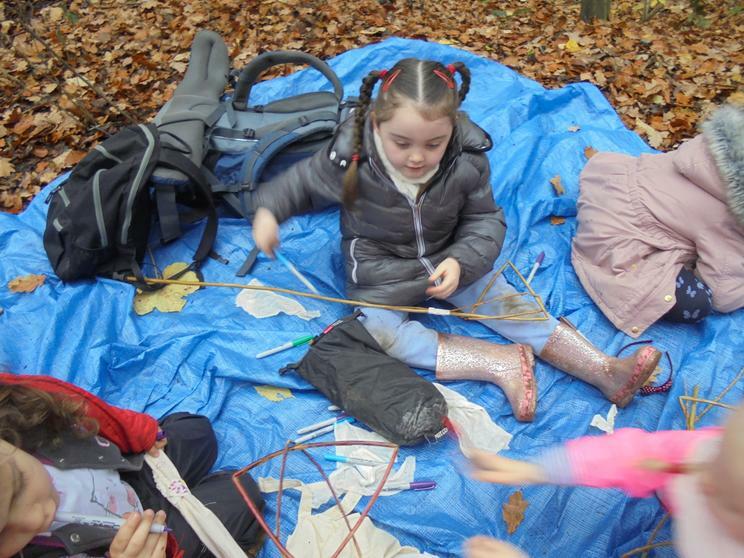 I think other children will want to make other things next week. 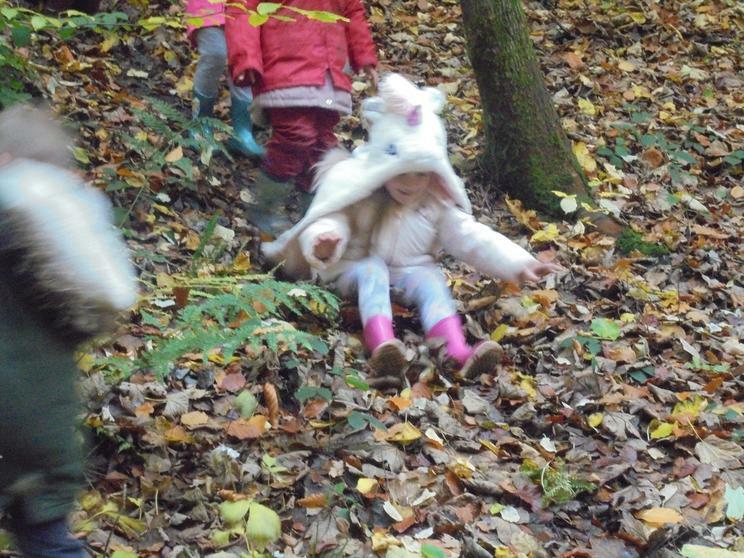 The children get to choose there own activities and there are some lovely pictures of the children playing in the slippery leaves. 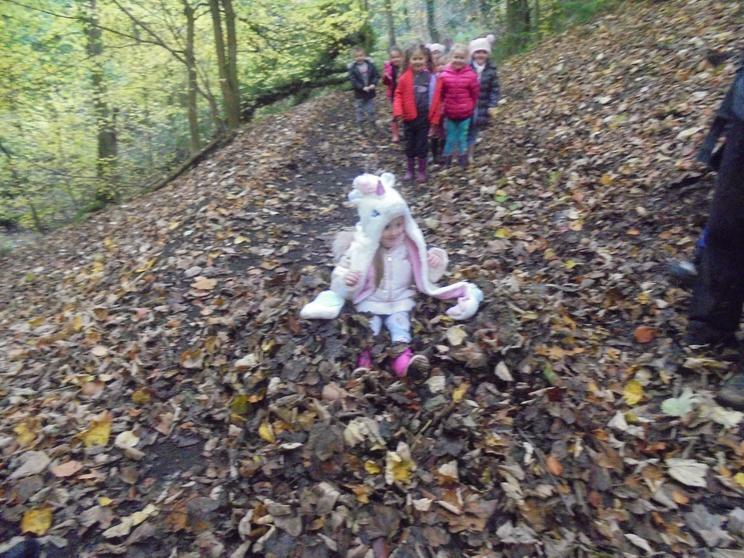 I thought that today was going to be a total wash out so packed extra hot chocolate. 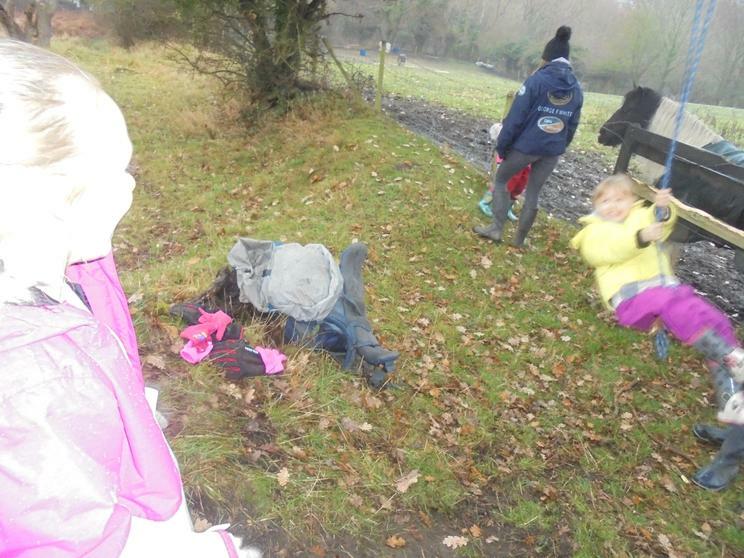 It was cold but we only felt it when we stopped moving. 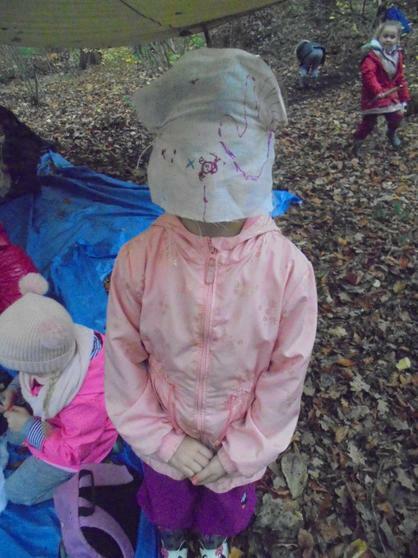 Instead of doing the craft things I had thought the children might like to do we played a new game. 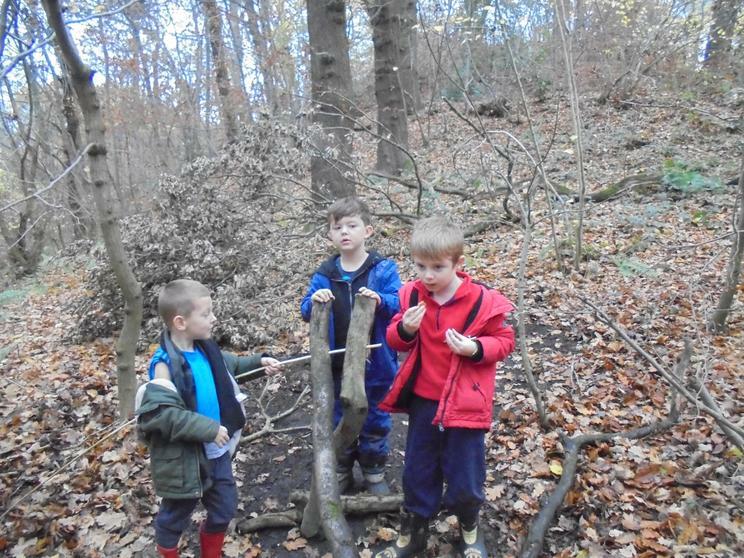 This allowed us to explore the Dene a bit further. 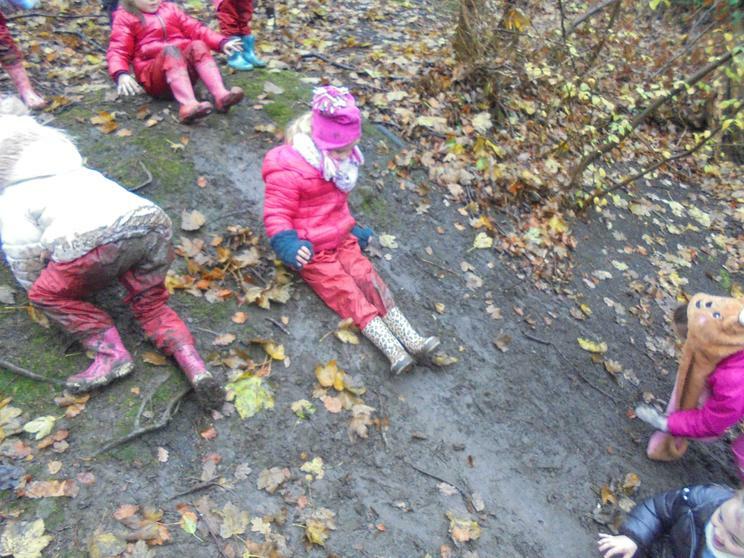 The game evolved into finding other fun spots to play in. 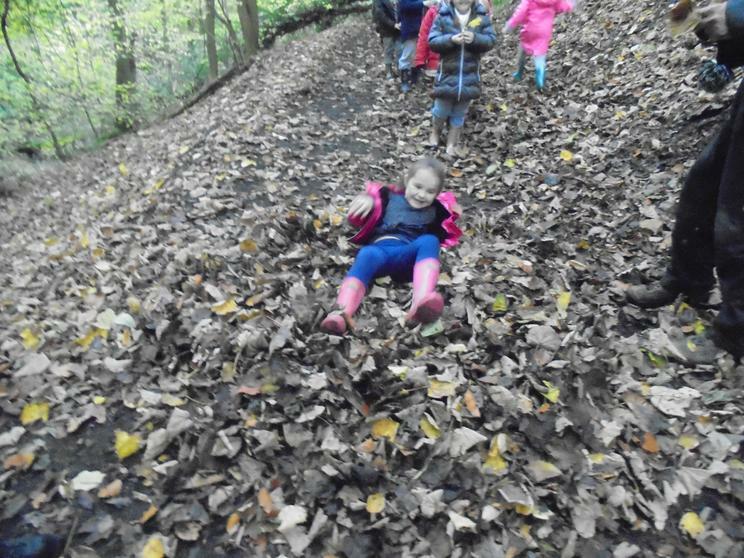 Madison found that because the leaves were so wet you could slide on them, we spent a good 20 minutes sliding. 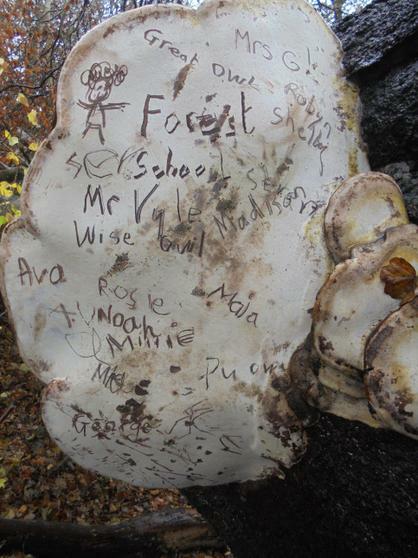 I found a fungus called artist's conk; a type of bracket fungus that grows on beech trees. 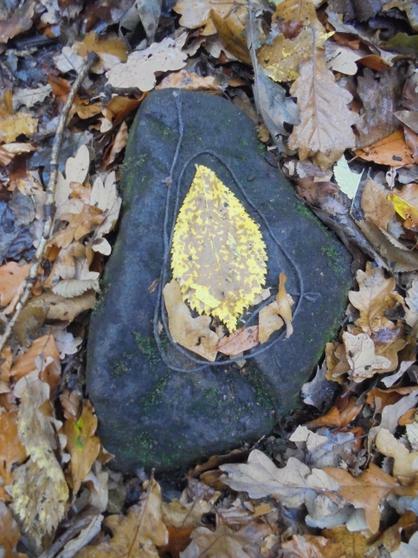 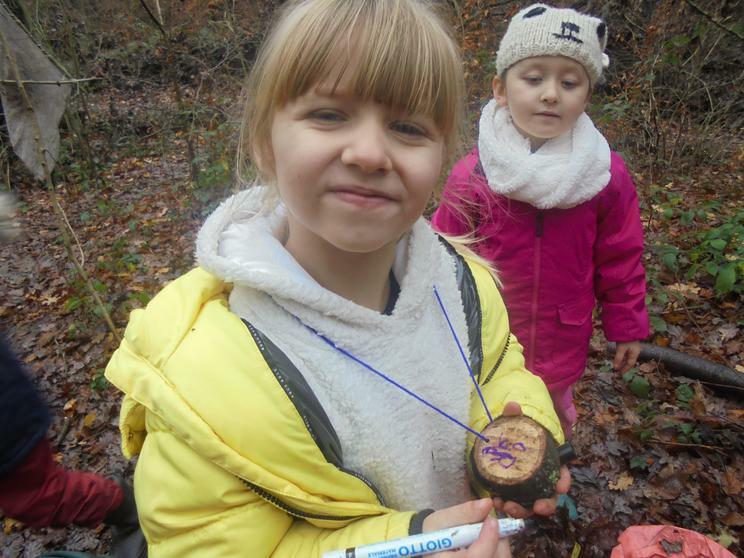 It is great for drawing on so we found a good twig and drew our names on the conk. 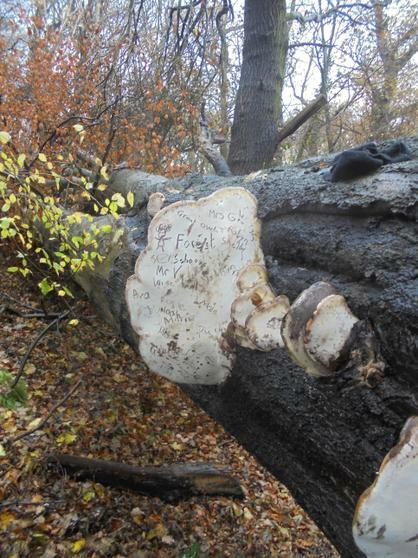 I wonder how long it will last for or if the writing will change as the fungus grows. 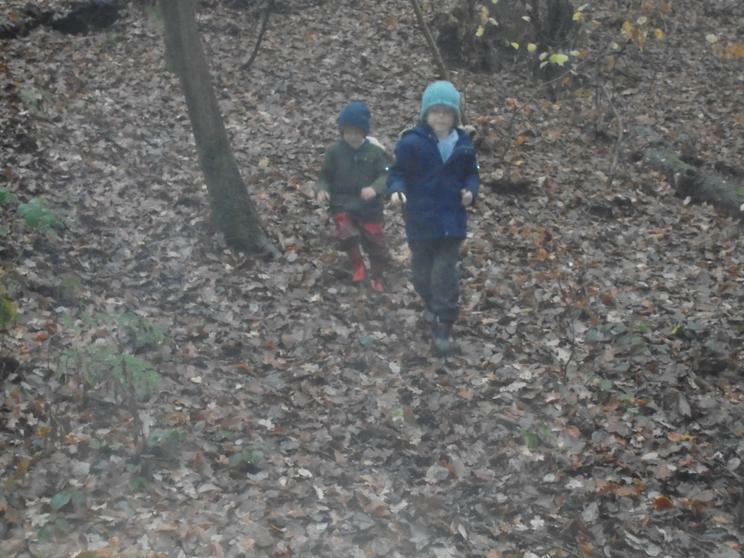 We haven't many photos today as we kept playing and exploring. 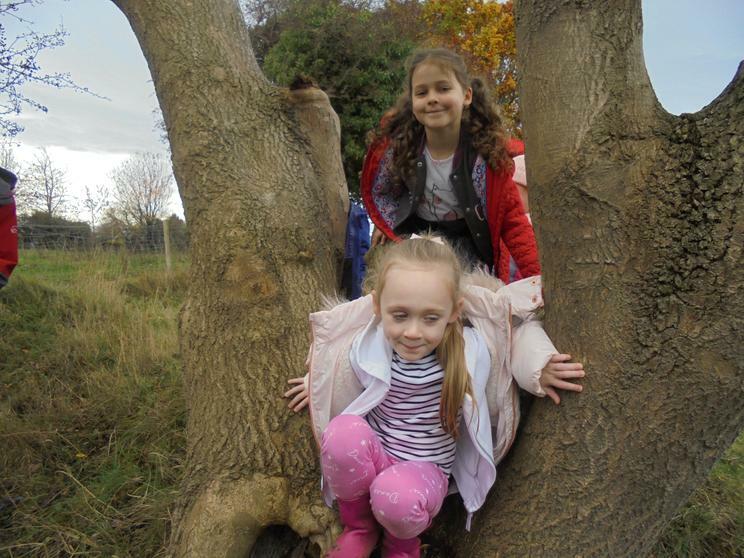 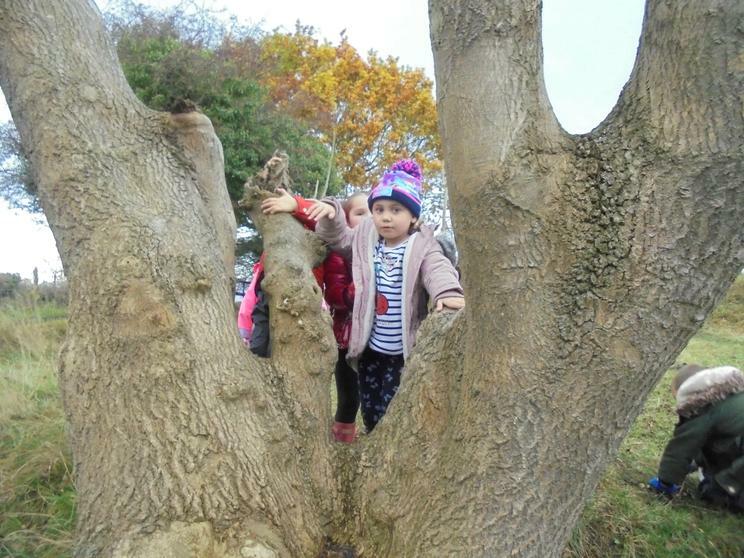 Today saw the Forest School group stopping by the climbing tree. 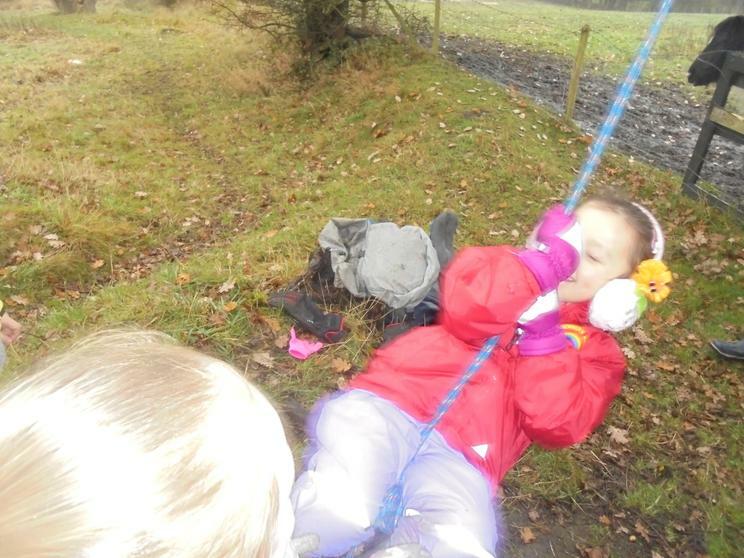 We have not done that in a while so we got the rope out and made a swing too. 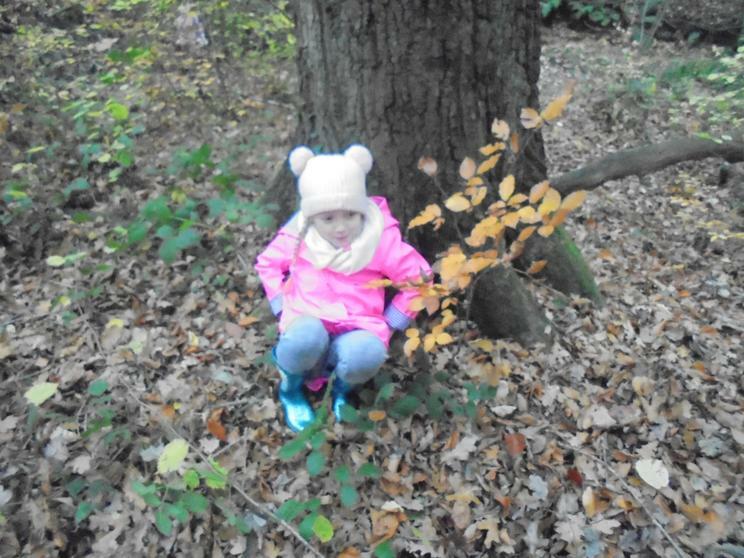 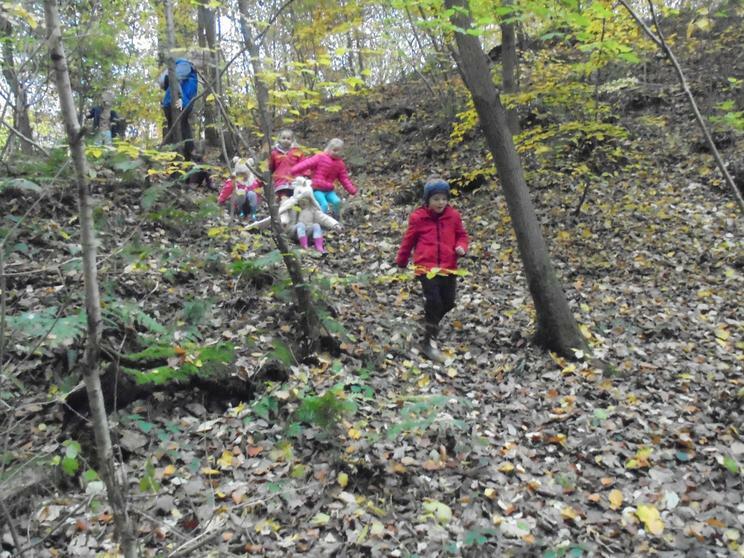 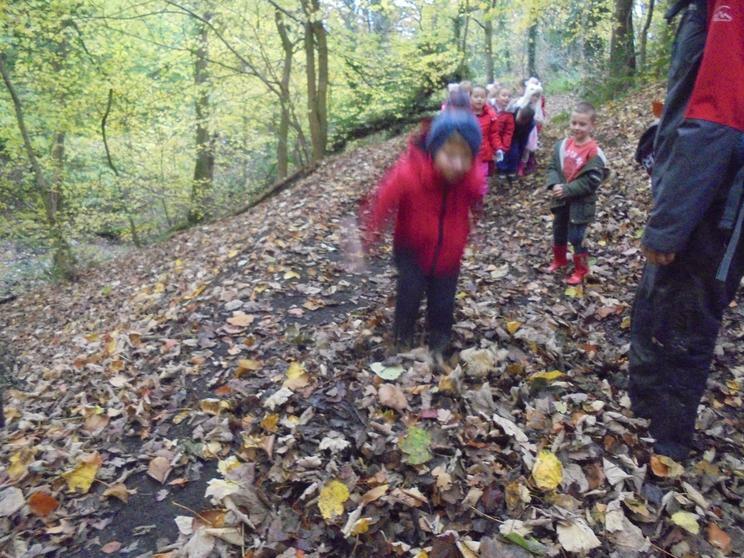 The leaves were far to wet to make a leaf pile so we went exploring up the bank. 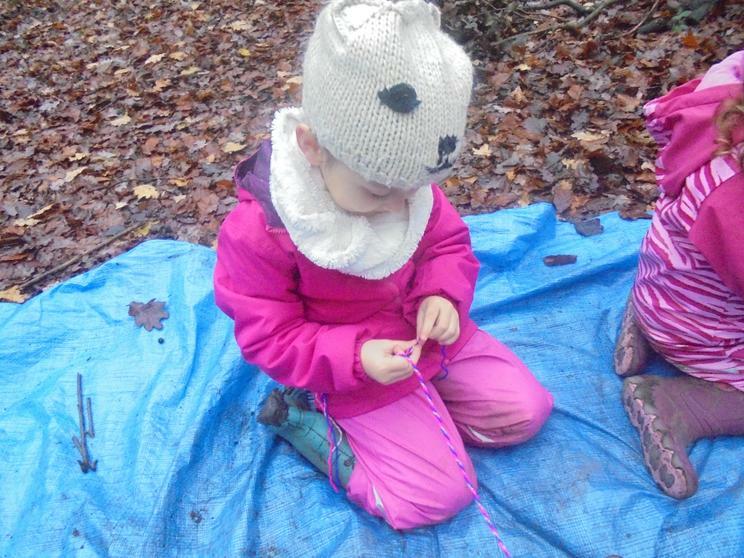 We found some amazing purple mushrooms 'Amethyst Deceivers'. 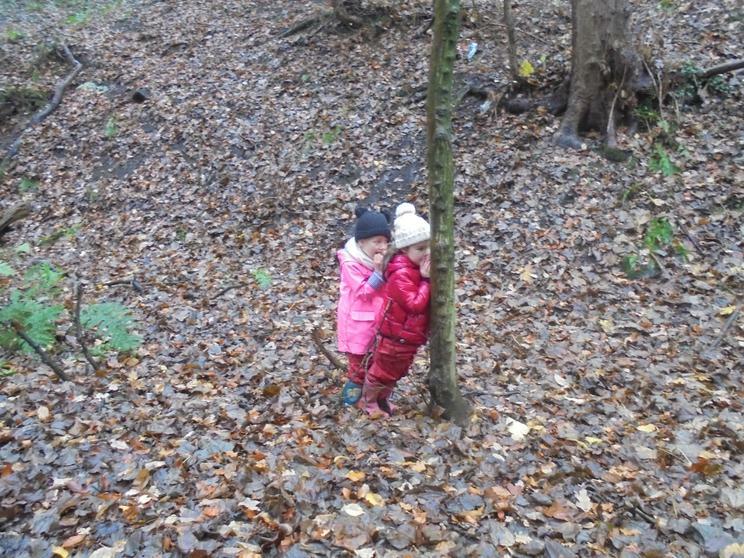 Apparently they are very common but I had never seen them before. 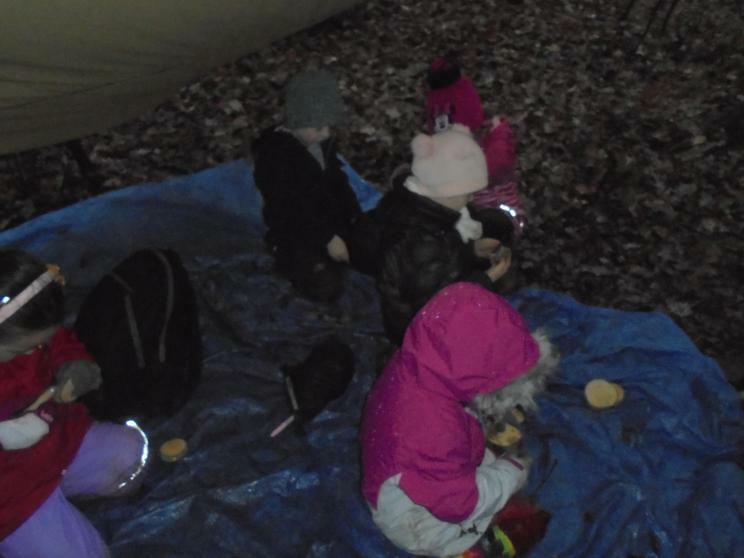 When we arrived at our camp spot we split into two groups. 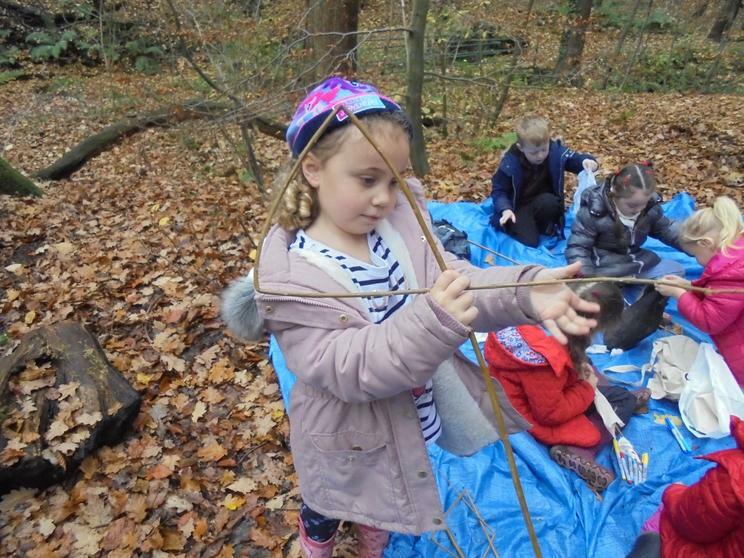 Ms. Gibson made willow stars and willow bark sting whilst I helped with Den making. 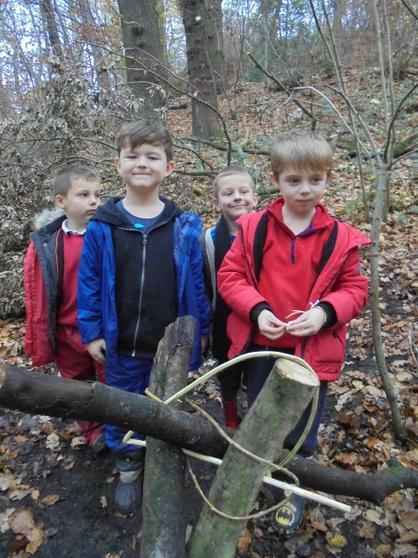 We needed to saw some of the storm felled wood up and drill holes so that we could make a structure. 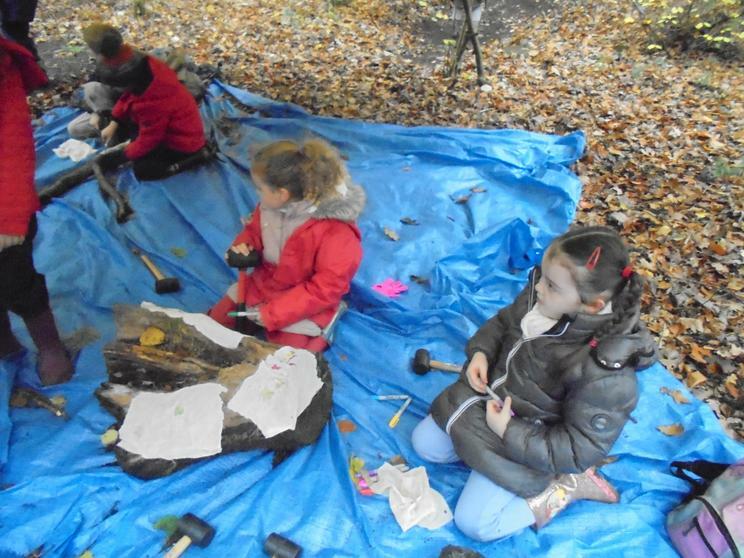 It is a lot of hard work, but ideas are starting to happen and there is a lot of imaginative thinking happening. 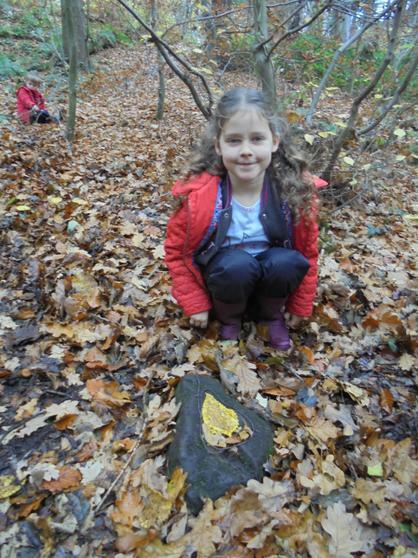 What a lovely first week in the woods we had. 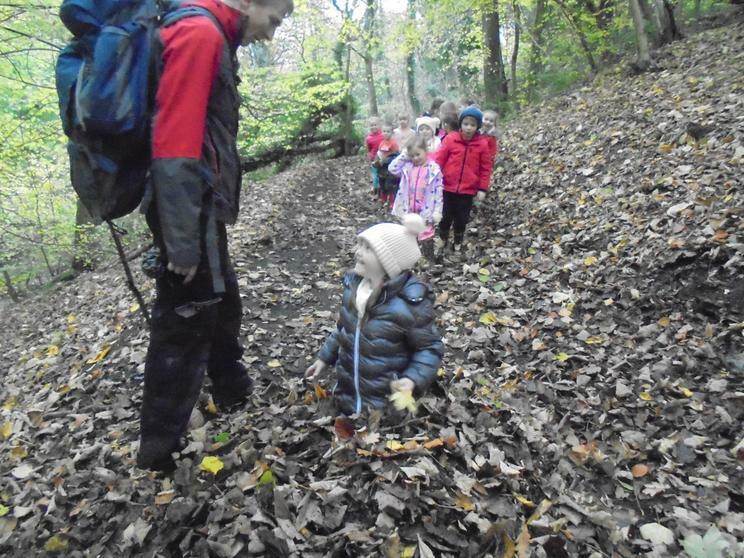 We had a parent helper along this week and she helped with all the activities. 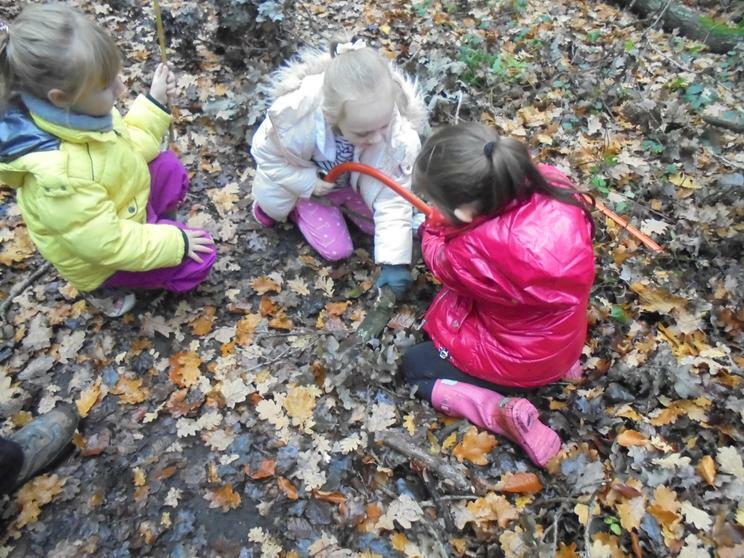 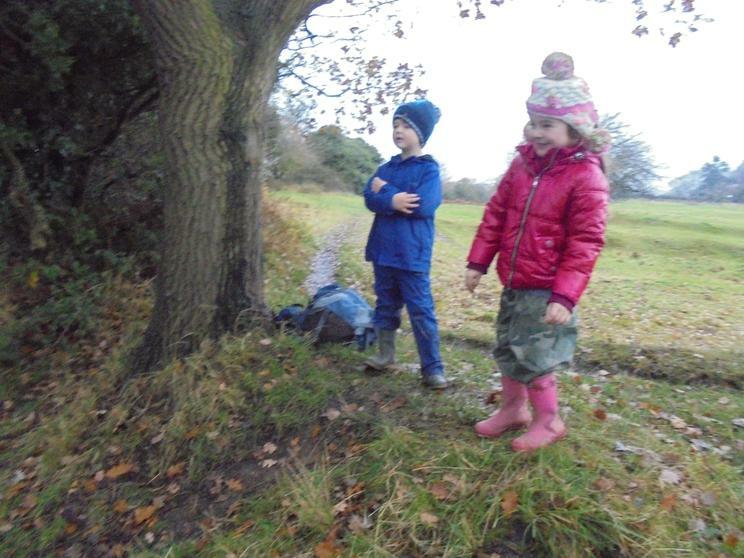 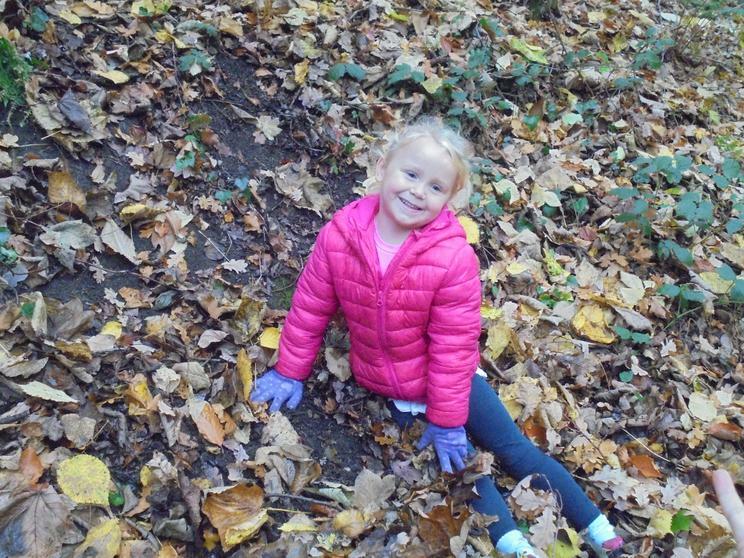 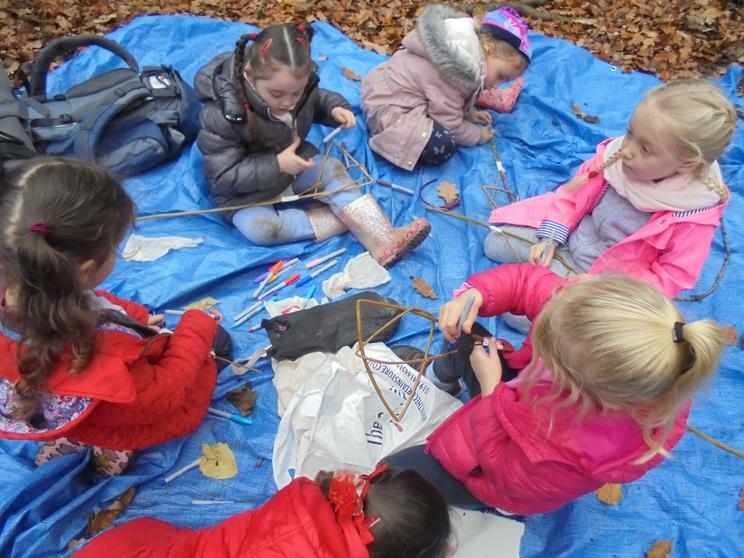 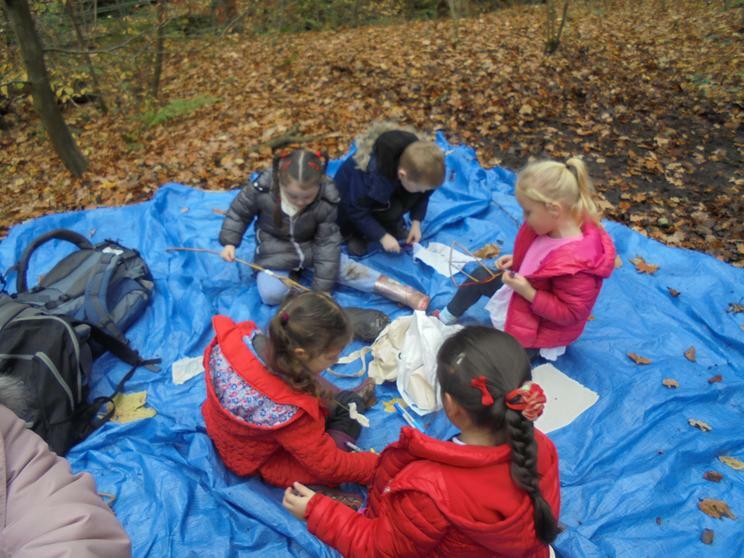 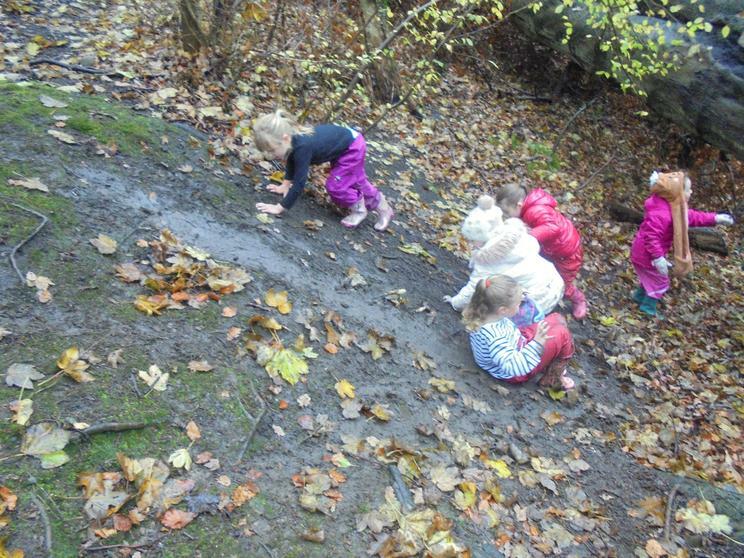 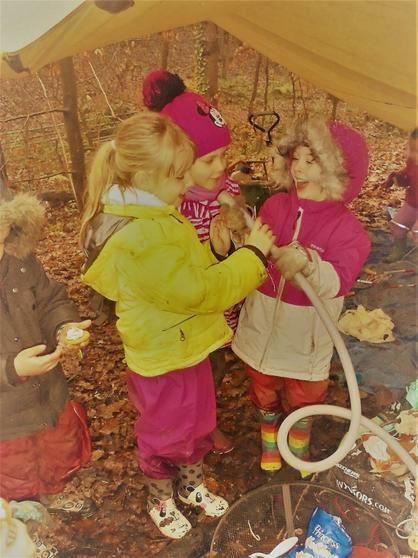 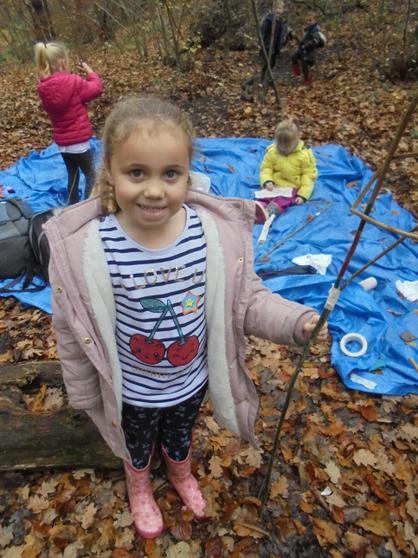 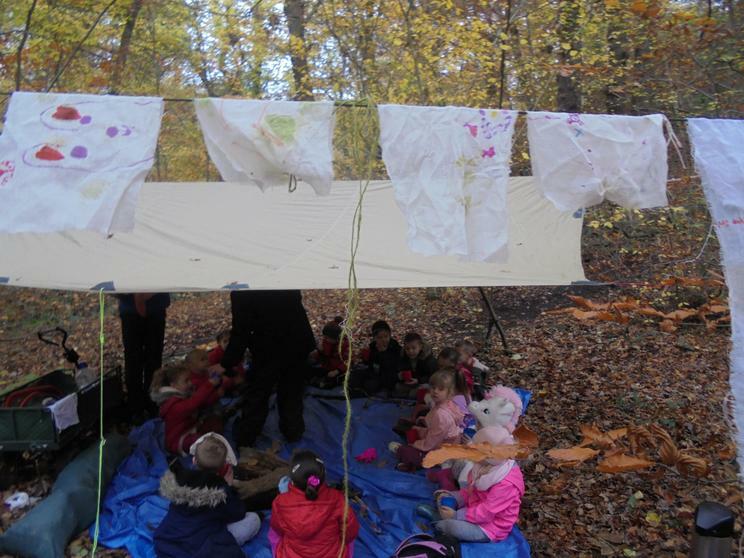 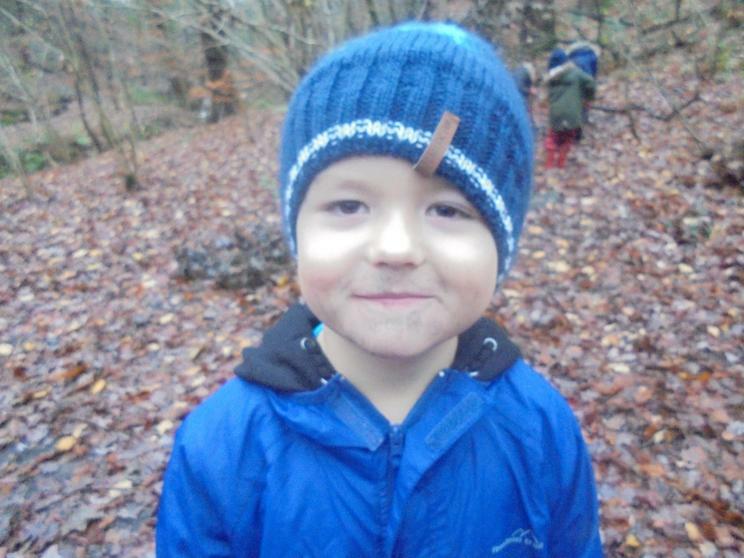 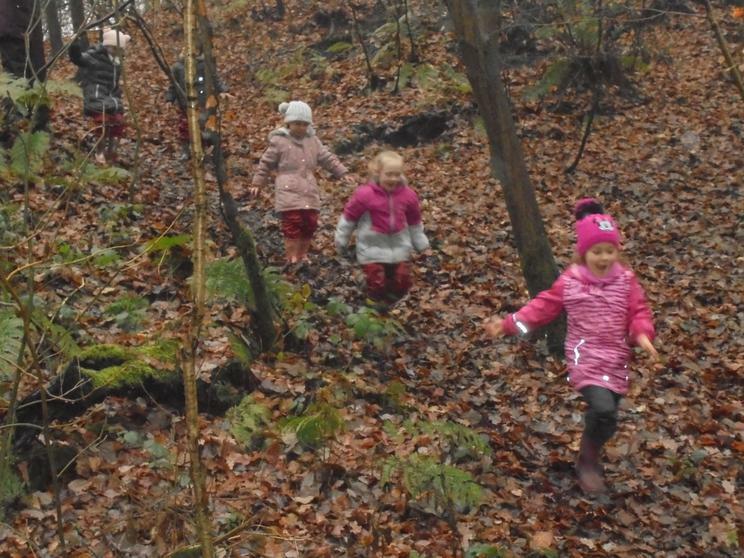 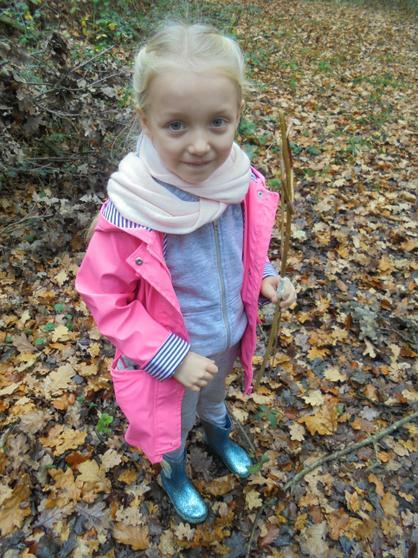 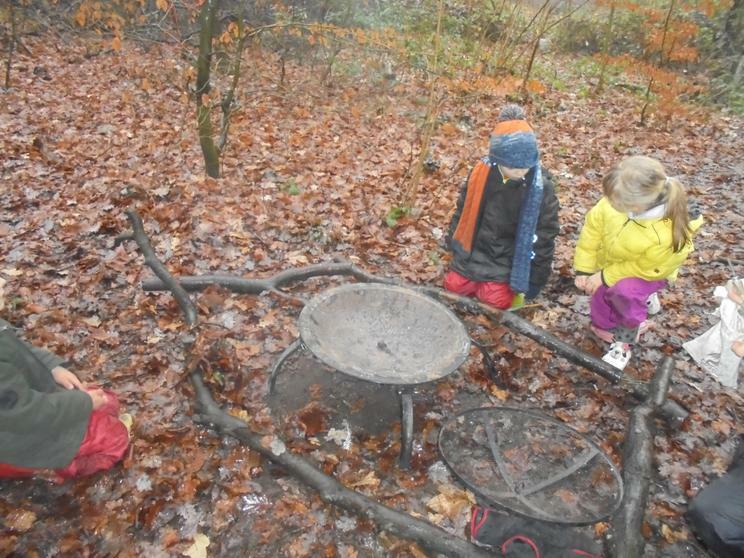 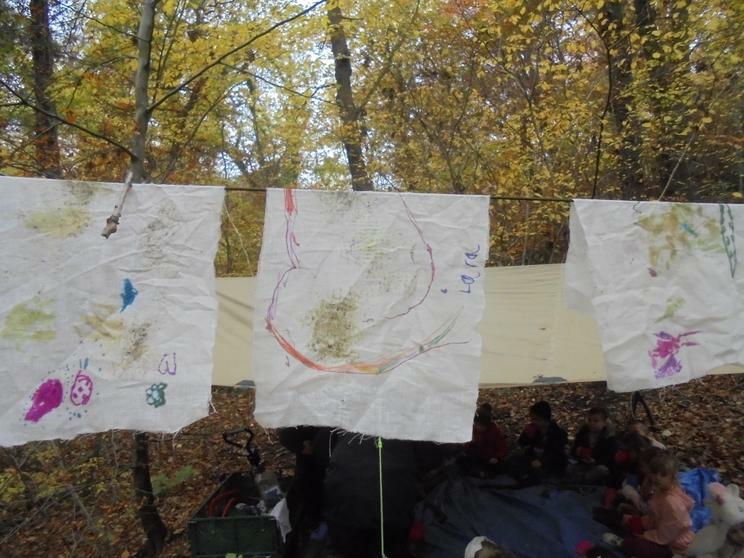 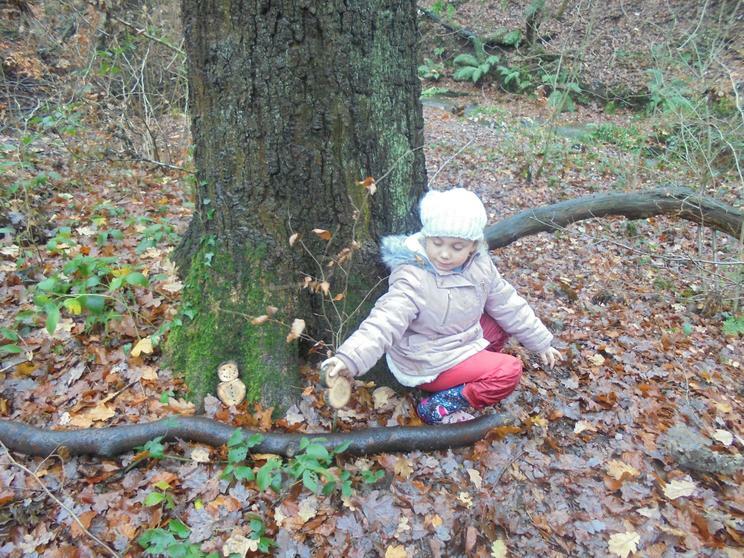 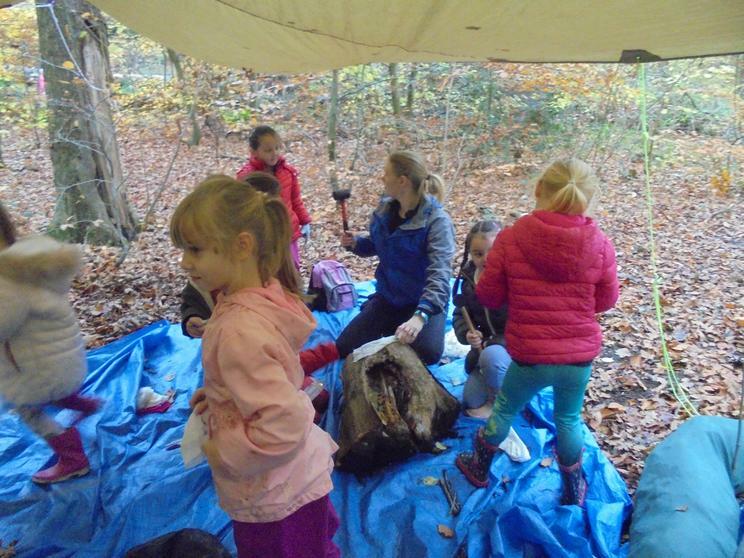 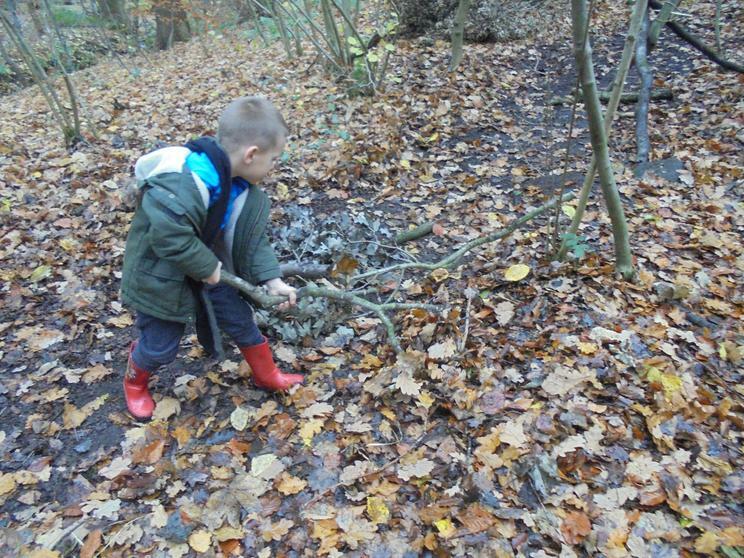 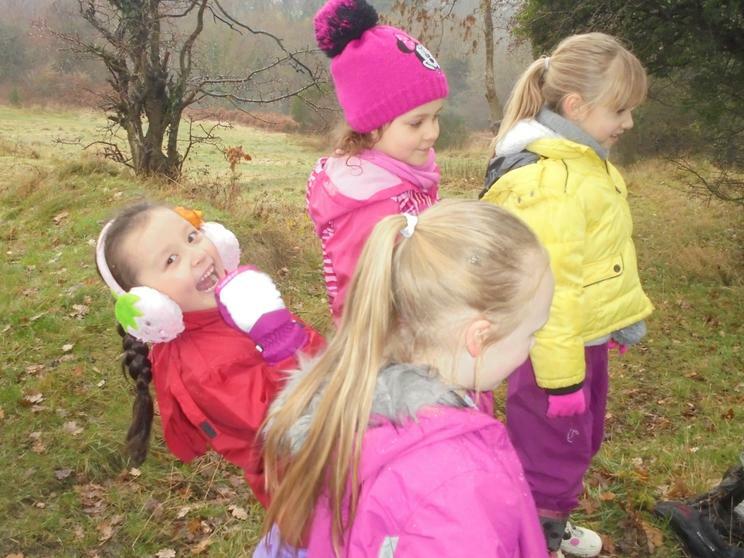 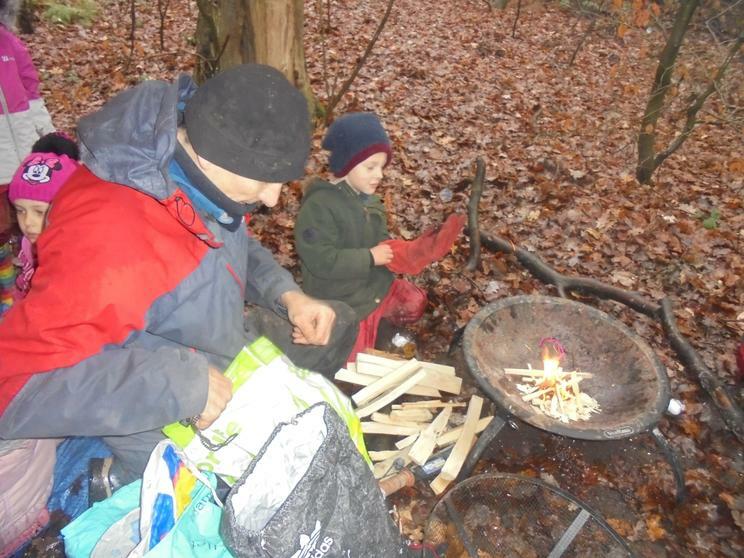 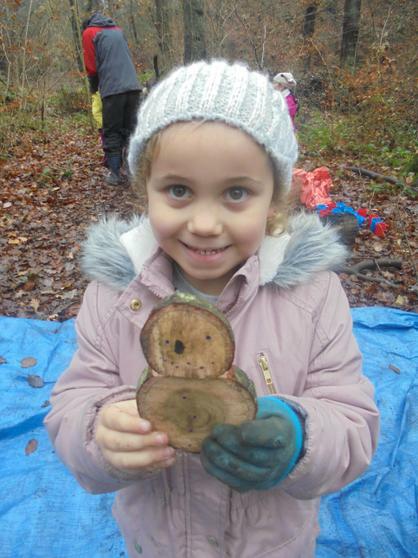 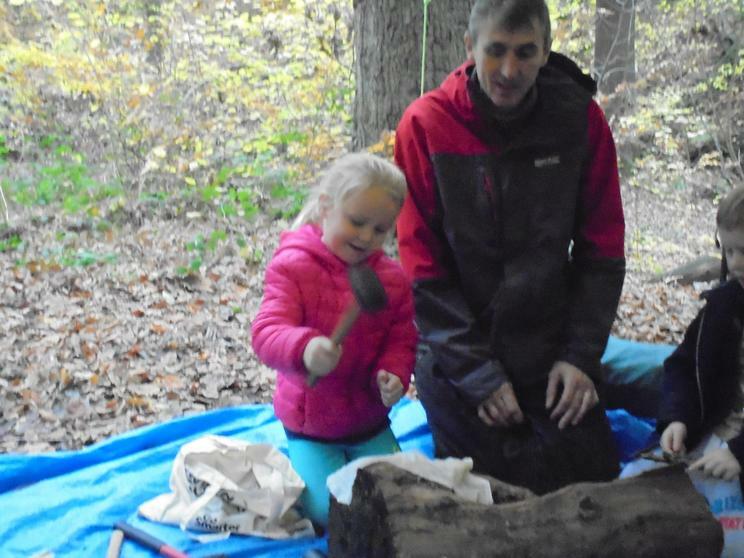 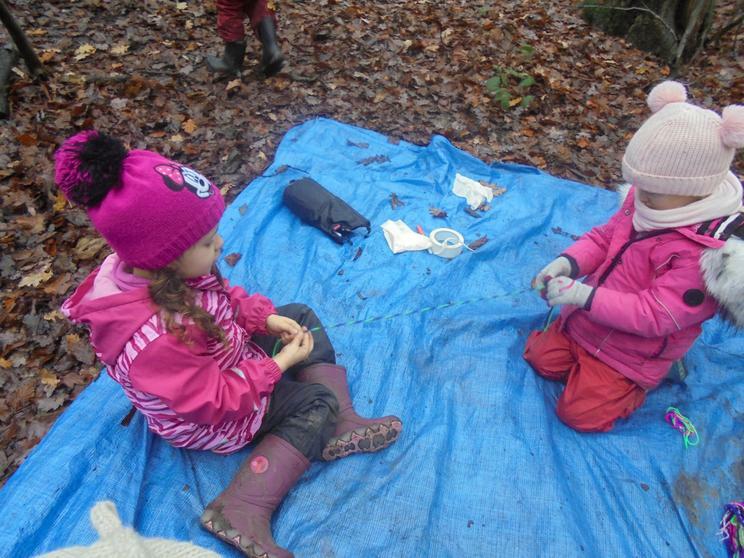 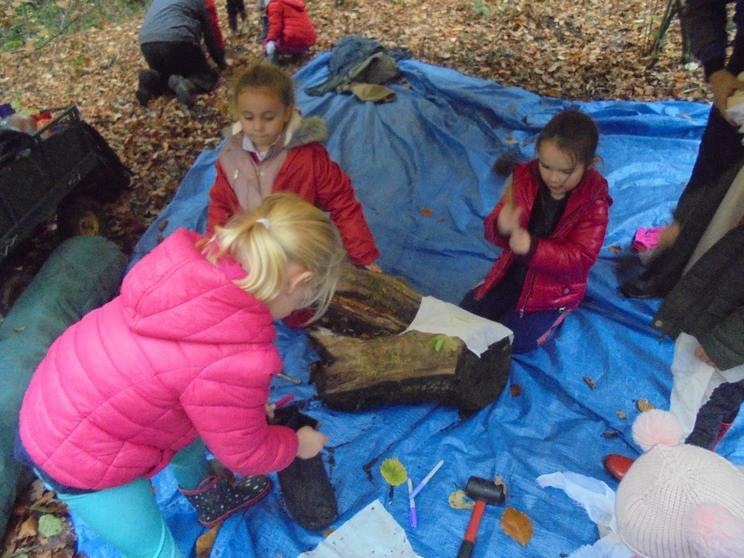 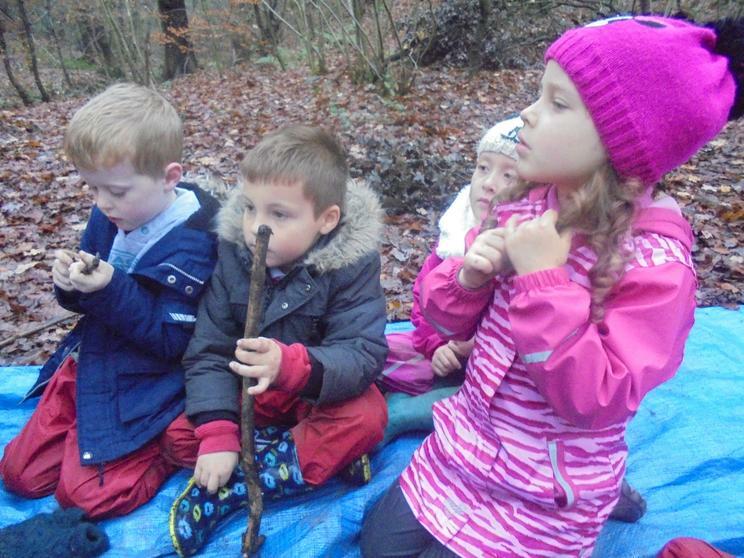 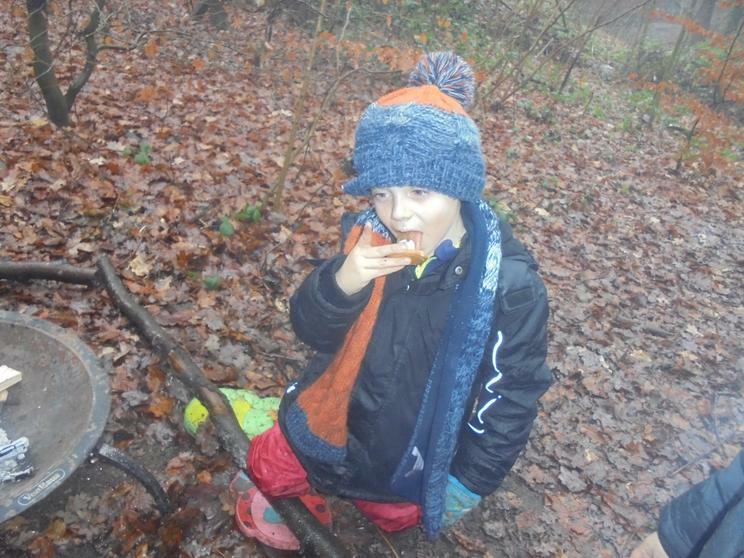 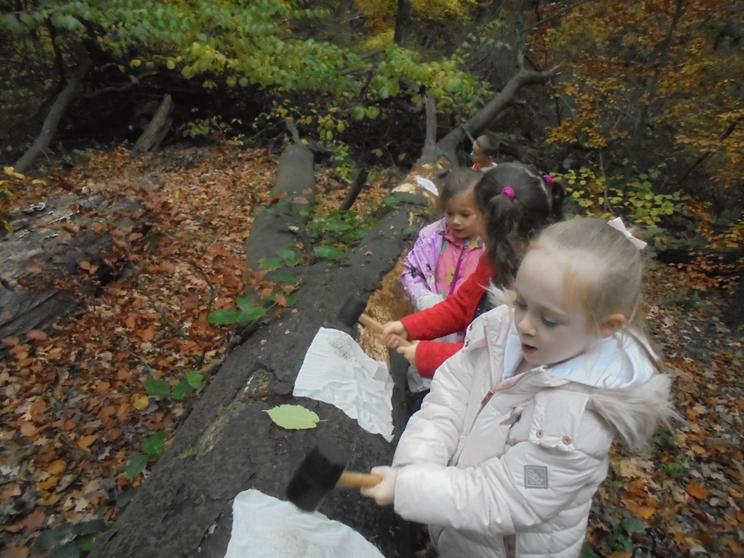 So many of the things that we do in Forest School come from ideas that the children have themselves. 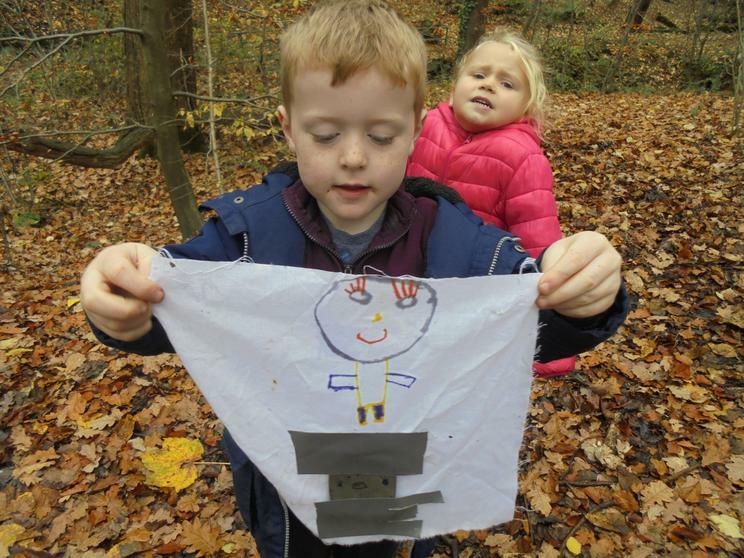 I had thought to make some autumn leaf collages as the colours on the oak and beech are fantastic at this time of year but children kept coming up with more and more ideas; making leaf faces, making masks, creating tornado paths, drawing, making whole body shapes. 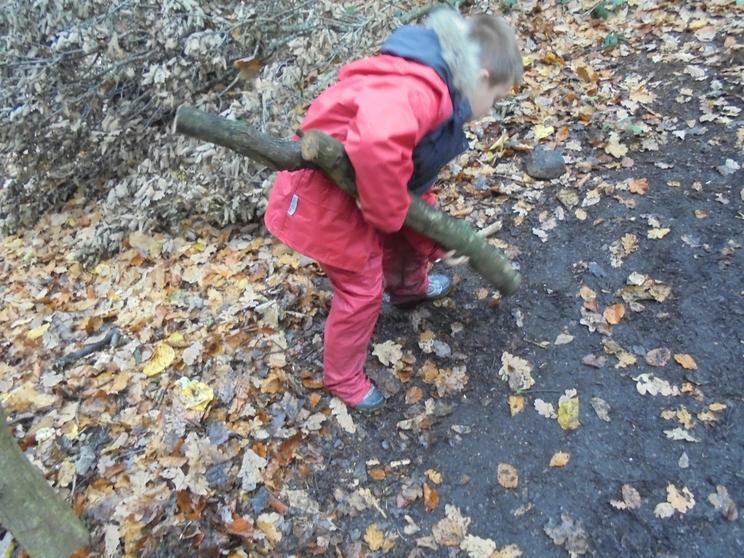 A lot of these ideas we will use for next week as there isn't time to do everything. 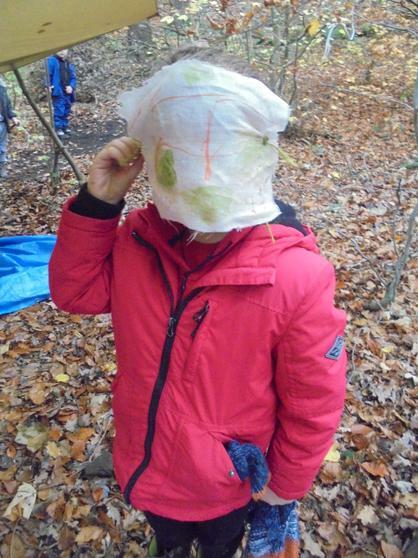 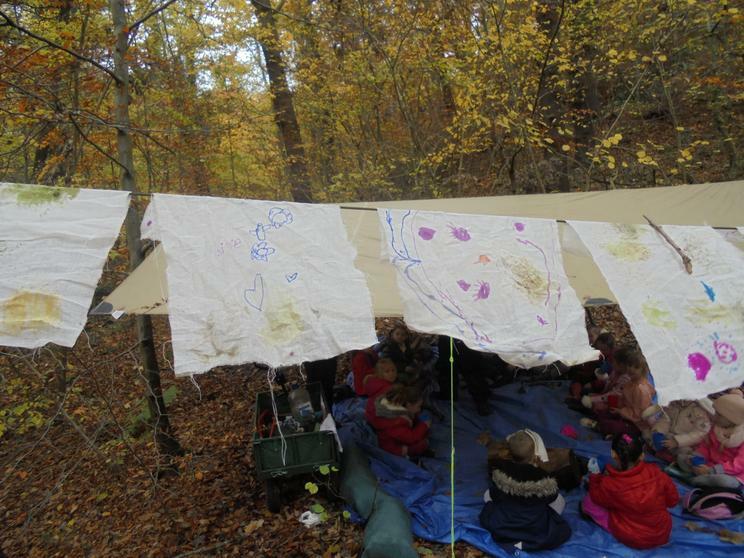 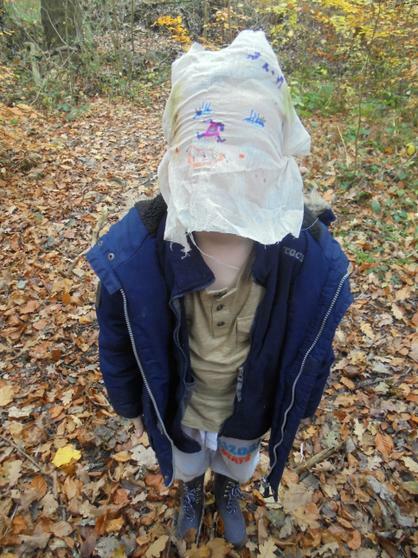 What we managed to do was make some lovely leaf prints that we then turned into masks. 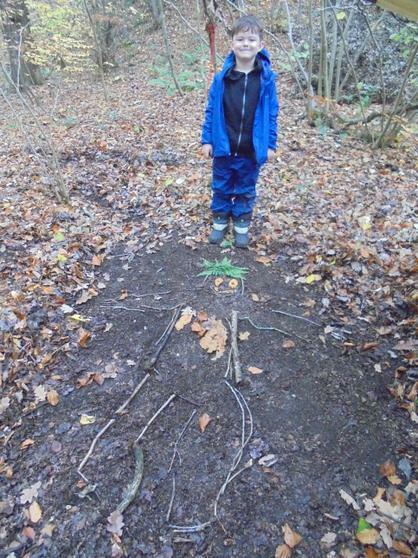 Beau was turned into a life sized stick man and Tyler and Logan made a super tornado path. 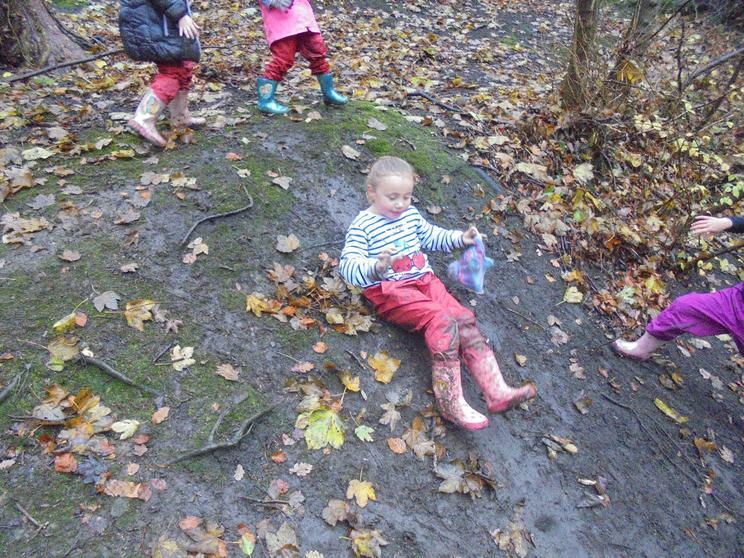 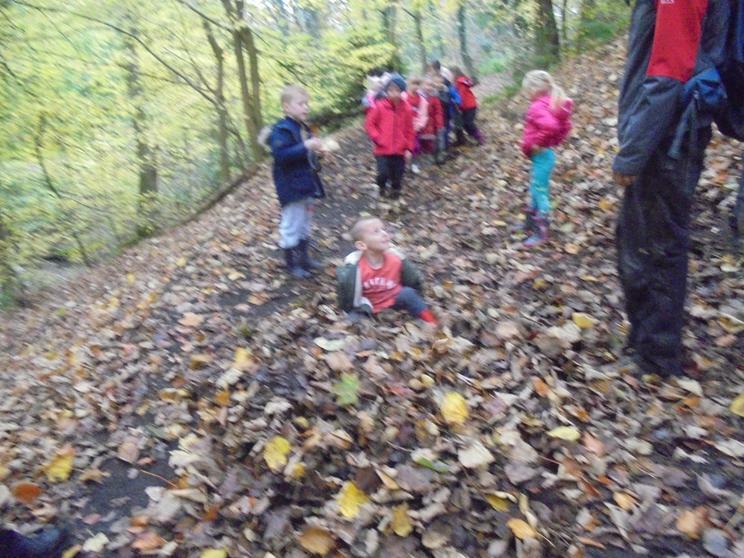 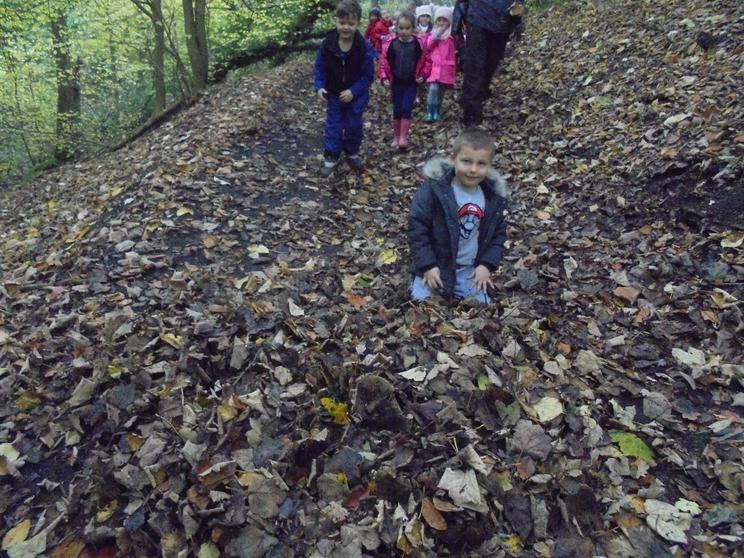 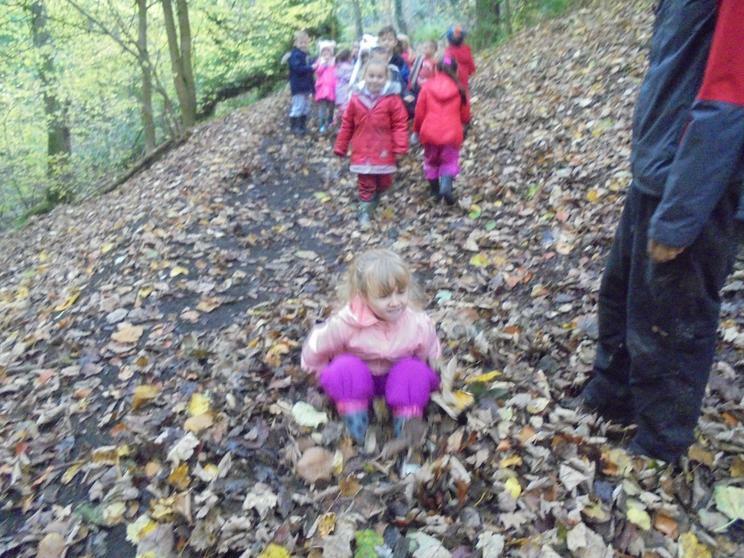 The favourite thing that the children did though, was to make a great big pile of leaves and jump into them.